I head to Minoc to ask around about getting a Caddellite helmet. As luck would have it, the blacksmith has already made one but some Fellowship members took it into a dungeon and I have to go and get it. 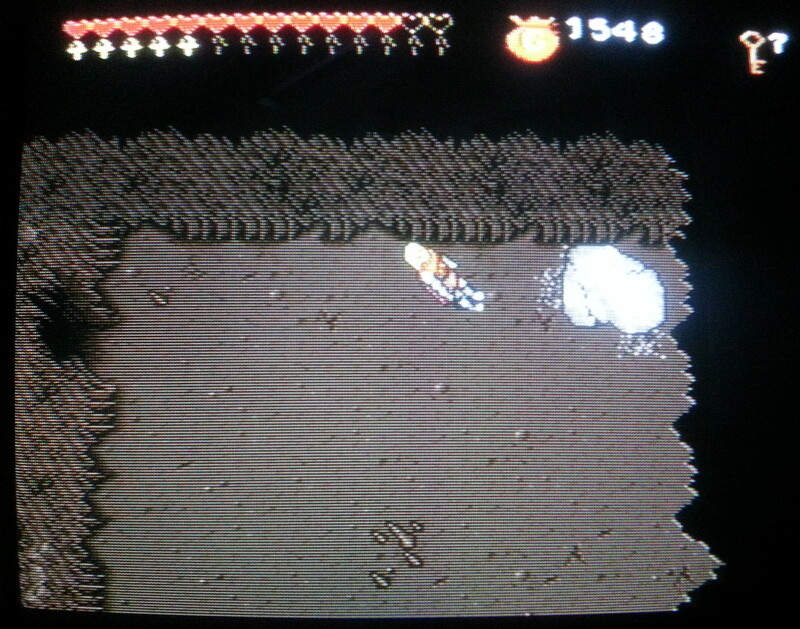 As ever, I have to fight a dragon at the end of the dungeon after which the helmet is underneath a giant boulder in the corner of the same room. Wearing my protective head gear, I can now attend to the final generator which is in a dungeon near Serpents Hold. I take the chance to look around the island while I’m there solving a side quest to track down the defacer of a statue of Lord British. The quest is the same talk to everyone in the right order routine that I’ve seen in just about every other town. Since Serpents Hold consists of 2 buildings and roughly 4 people it’s done in less than 5 minutes and I get some magic armour for my efforts. 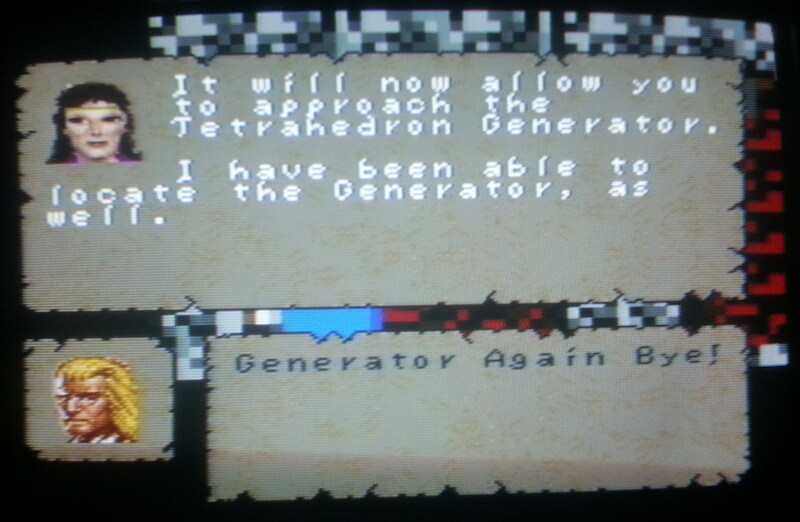 The dungeon doesn’t take a whole lot longer and I soon have the final generator dealt with. 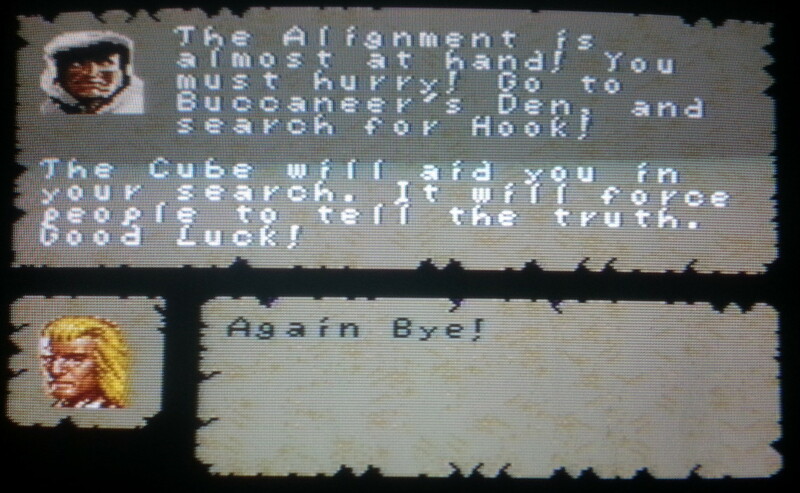 The Time Lord sends me off to Buccaneer’s Den where I should now be able to get the Fellowship members to tell me the truth thanks to the cube I recovered destroying the final generator. 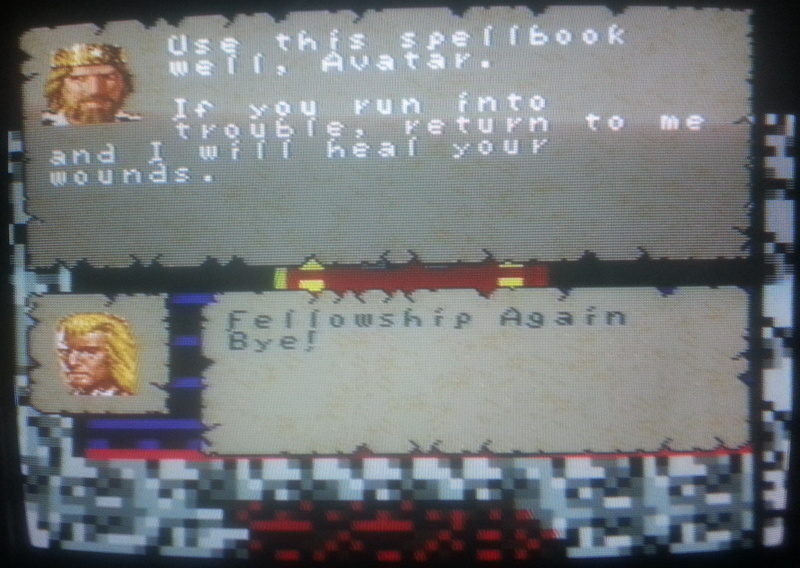 I loved being able to get confessions out of all the Fellowship members about what was really going on in the original Ultima 7. This is “slightly” cut down here and only affects 2 people that I could see. All they do is point me toward Hook’s quarters where I find a note saying that he is now on the Isle Of The Avatar. On Buccaneer’s Den I can also gain access to the House Of Games here which is a giant multi-level dungeon that appeared to serve no purpose whatsoever other than keeping me occupied for 20 minutes. When I eventually get out of it, I’ve gained little but my Avatar has made it to level 8 at long last. 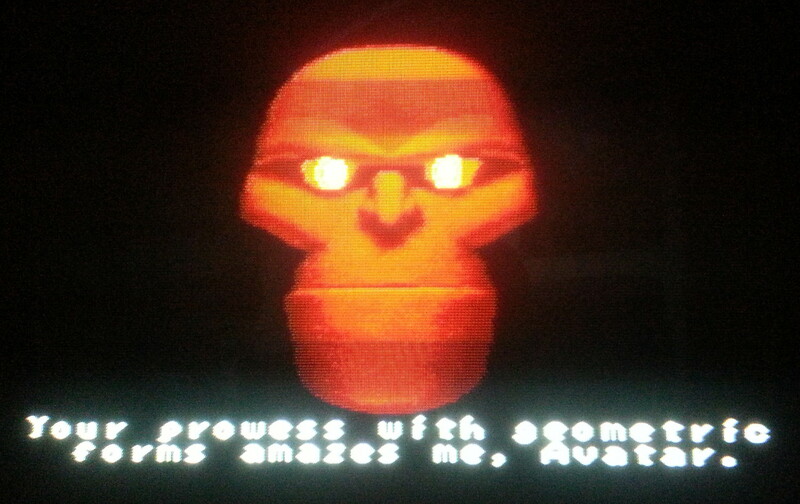 I head for the Isle Of The Avatar to wrap things up. There are a couple of buildings on here with their own mini dungeons which initially distract me. When I’ve figured out that these aren’t where I need to be, I find the dungeon I should have headed for in the first place further to the North. This has lots of locked doors and not so many lockpicks and I end up being low on magic for much of my trip through it with all the unlock spells I have to cast. My mana does recharge over time but I keep having to leave the game running for a few minutes while I wait which didn’t make for the most thrilling of finales. When I do discover the black gate, the climactic fight is done entirely in the dark as I don’t have any magic to cast illumination. Batlin escapes but the battle goes well otherwise. 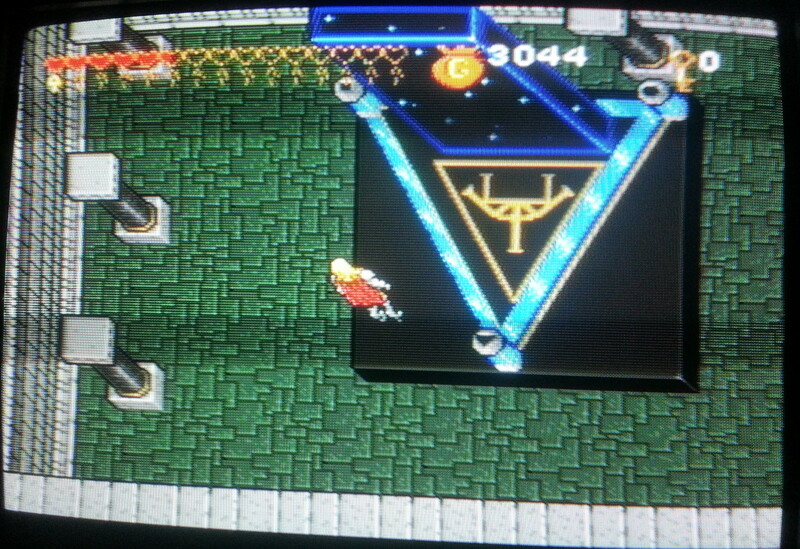 After waiting a little longer, I can shed some light on the room and discover the black gate. I place the shapes in the appropriate corners of the triangle surrounding this all the while getting ludicrous taunting from the Guardian. I then have a choice as to whether to return through the gate or destroy it. 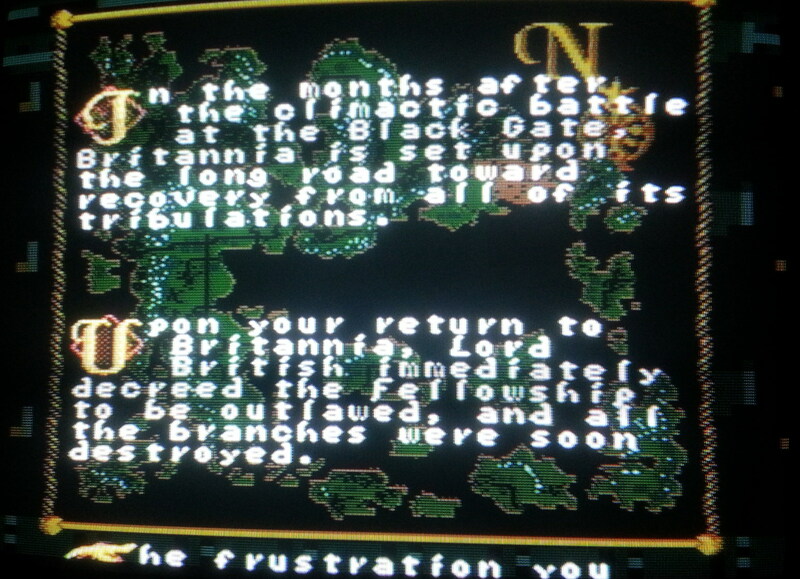 If I could have saved my game and tried both, I would have done but since I’d have to replay the entire dungeon I instead go for the appropriate Avatarly option to destroy the gate thus trapping myself in Britannia. 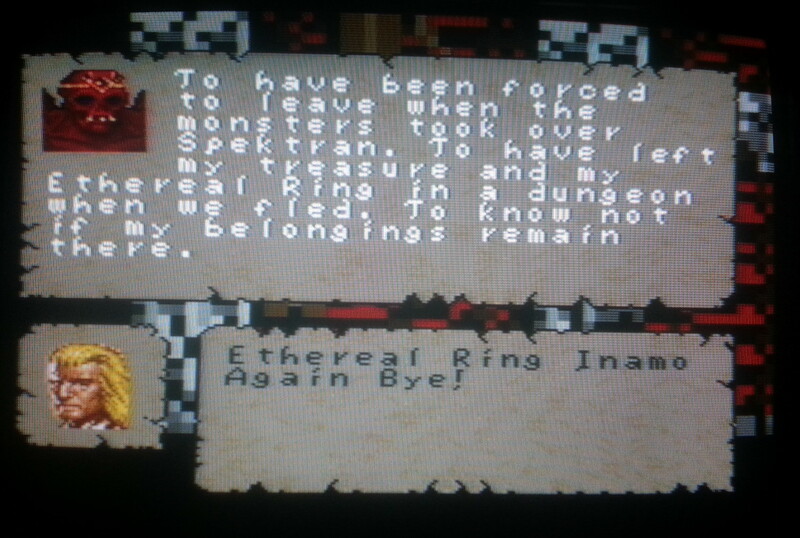 Ultima 7 is a game I’ve always wanted to return to and play through again but the SNES version hasn’t fulfilled this. There just wasn’t enough of the original here for it to be the same game. Whether it deserves its terrible reputation depends on your point of view though. Anyone who bought this expecting a port of PC game (which would hardly be unreasonable) would have been sorely let down. Putting the original game and the rest of the series to one side, I’ve had a decent enough time with it. The combat is silly but quick and simple so it doesn’t get in the way. 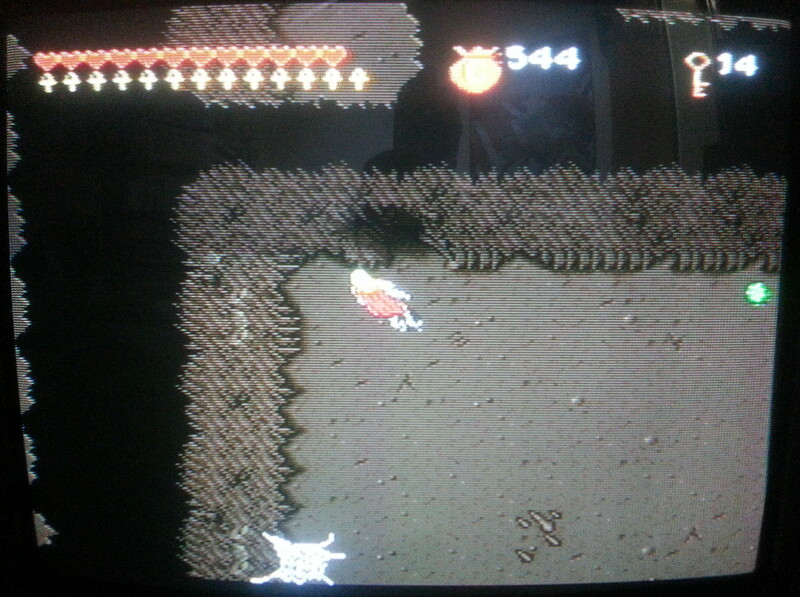 The dungeons where I spent most of my time offered a puzzle/exploration side to the game which worked reasonably well. 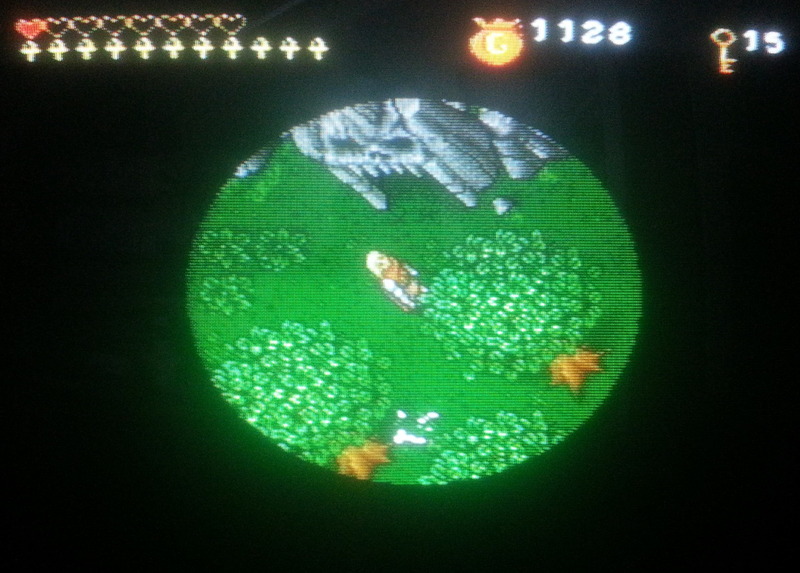 Combat aside (never a highlight of U7 in any version), the game engine appeared to be capable enough and worked well with the SNES controller. I could have lived without the constantly respawning creatures but other than that I think this is a passable hack and slash RPG-lite. 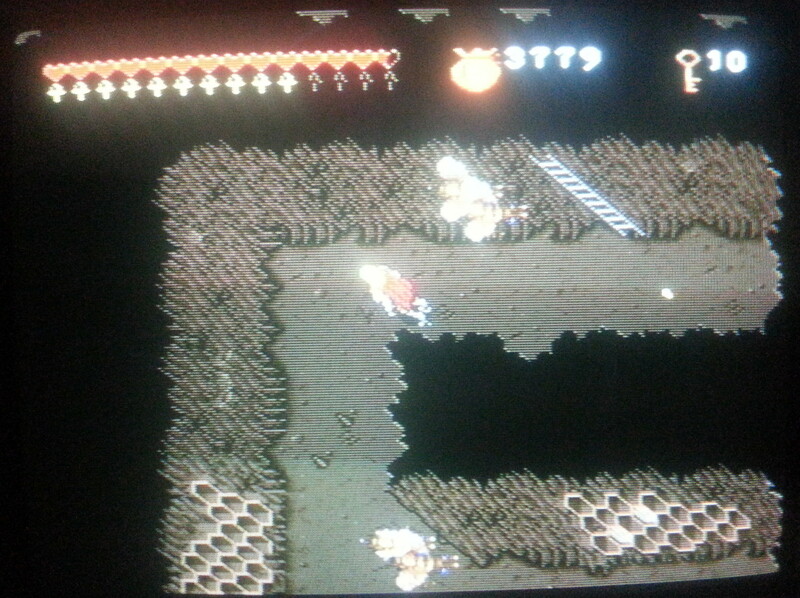 It should have been a lot better but there were plenty of games on the SNES that were worse than this. I’m curious to know what the story behind the port was and whether it was deliberately simplified to this extent or a consequence of time/budget constraints. I had a browse through a load of the Point Of Origin magazines to see if there was any info but it barely gets a mention. 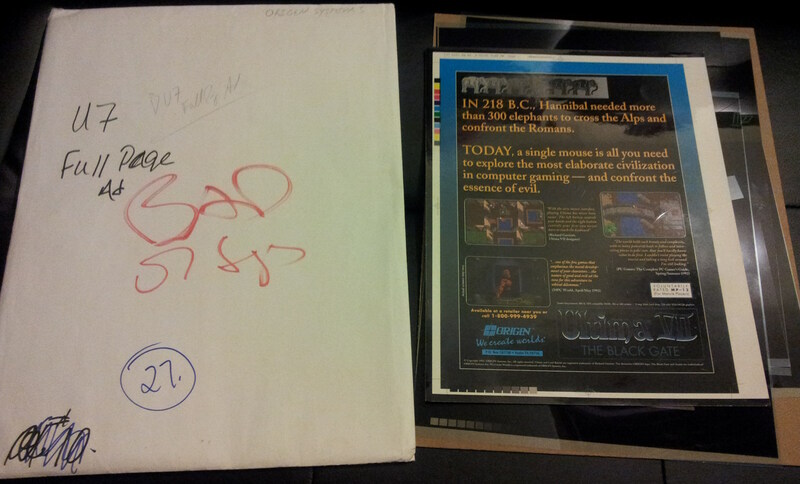 I did find references to U7 SNES going into testing in July 93 + being signed off about a month later. After that it doesn’t seem to be referred to ever again as far as I could see at least up until late 94 when I gave up looking. It’s the same for the other SNES games from around this time which does give the impression they were very much in the background compared to Origin’s PC products. The 3DO and Super Wing Commander also got a huge amount of coverage over this time period with Origin looking to be seen to one of the leader for what was purported to be the next big console at the time. There was a small article about focus groups with Billy Cain (who also worked on U7 SNES) in which he talked about using focus groups when testing Metal Morph. He isn’t specific but mentions “the kids in our group” which possibly says something about who these games were being aimed at. By contrast, the following year several people were chosen to test System Shock from Austin residents who had previously filled in Underworld registration cards – the average age of that group was 29. 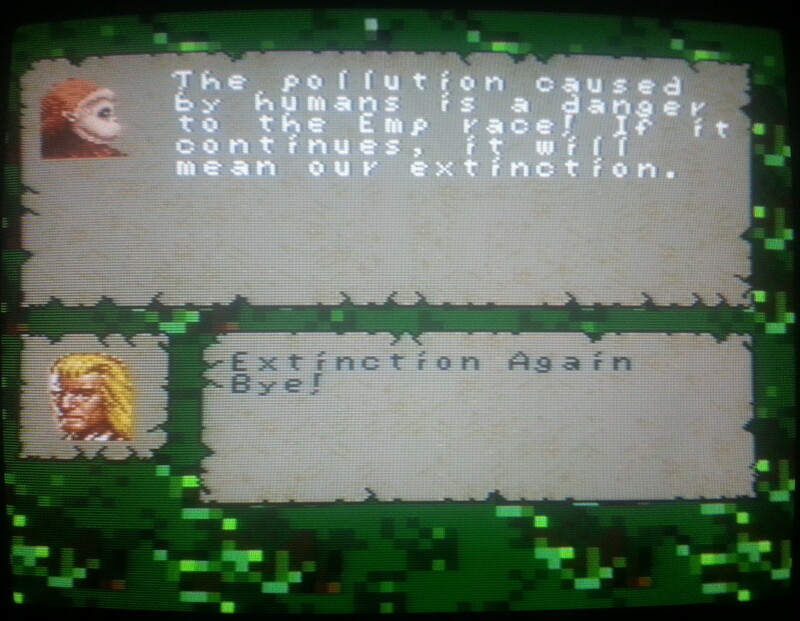 It may not be mentioned in their newsletters but Origin did continue with SNES development long enough to create the Savage Empire port after this which used the U7 engine. With the smaller world and limited number of NPC’s, I can see how that could have worked out quite well. I’d certainly like to play it were it to be available in English so I hope that translation is coming along but I’ve not heard anything about it in months. In the absence of that, the next game on here is likely to be something on the Apple II (if Parcelforce ever get their act together and deliver the CFFA3000). I finished off part 1 about to head for Cove which is a short hike to the East of Britain. The main quest here is to get Rudyom’s wand which assuming this all pans out how I expect I will be needing much later in the game. This is being kept safely in a dungeon for some reason offering my first chance for some serious dungeon delving. 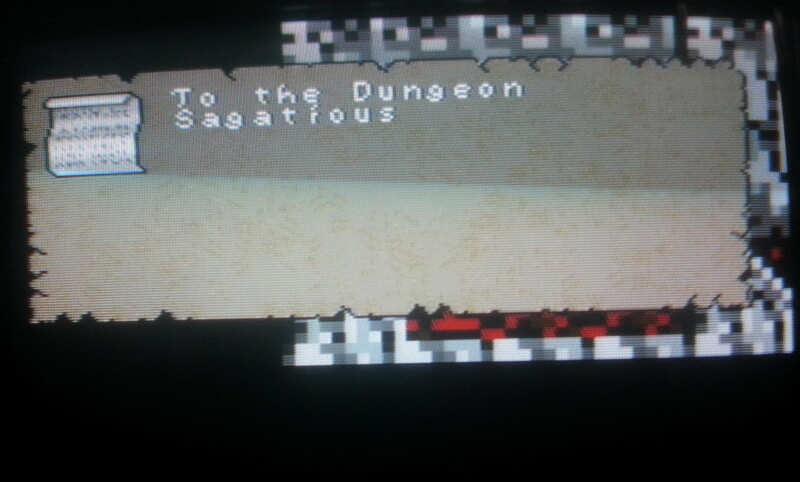 Using my newly available illuminate spell, I can now see all the way to the edge of the screen in the games dungeons. The layouts are all grid based with square corners and are essentially mazes. There are keys to be found in some of these for specific doors and levers to be pressed so there are simple puzzle elements + lots of monsters of course and to be fair they are reasonably fun to play through. 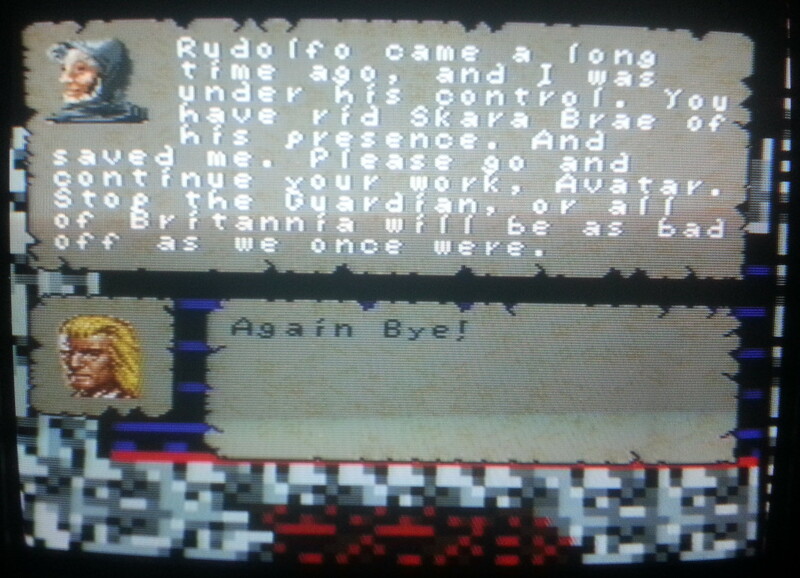 Ultima 7 only allows for one save game and no saving whatsoever in the dungeons. Given that they are quite large, I’m glad that the combat is easy or restarting could soon become a chore. 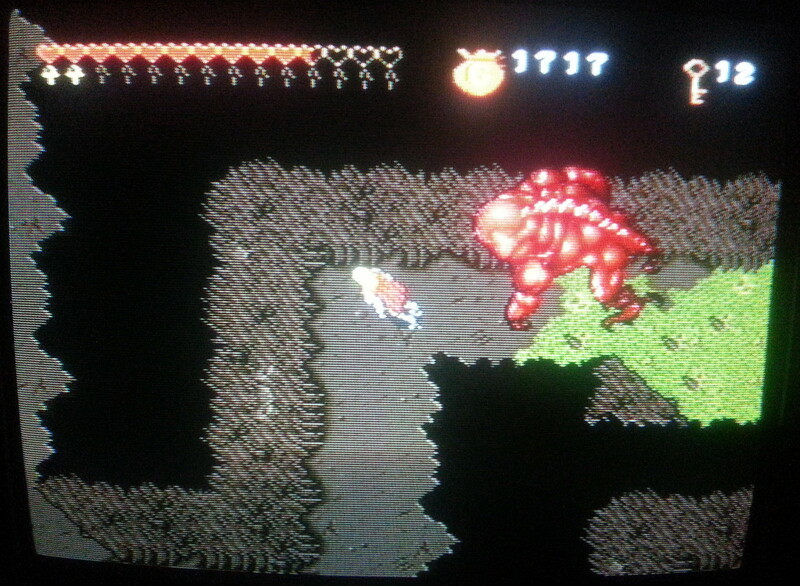 At the end of the dungeon is a large red dragon acting as a boss guarding the wand. You’ll have to imagine this as I didn’t fancy trying to grab a photo while being chomped by it. 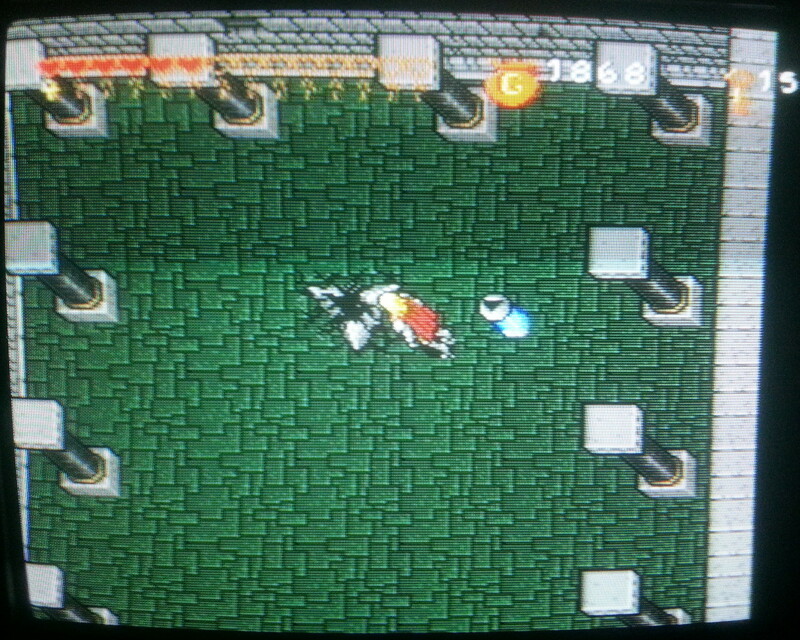 Once bested, the dragon drops a key which opens up a door which conveniently whisks me back to the surface. There is some variety but this turns out to be a typical layout for the many dungeons ahead. 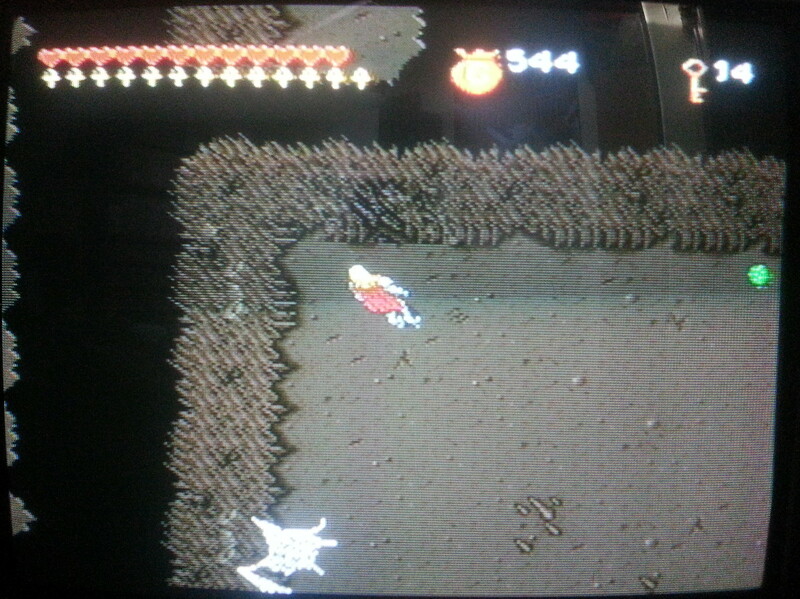 It’s best to heal up before taking the exit door as all the creatures guarding the dungeon entrance have respawned which nearly caught me out on this first dungeon. I had a pair of delivery quests to complete from part 1, the state of both of which was apparently not stored in my save game as I had to go back to Britain and restart each of them. 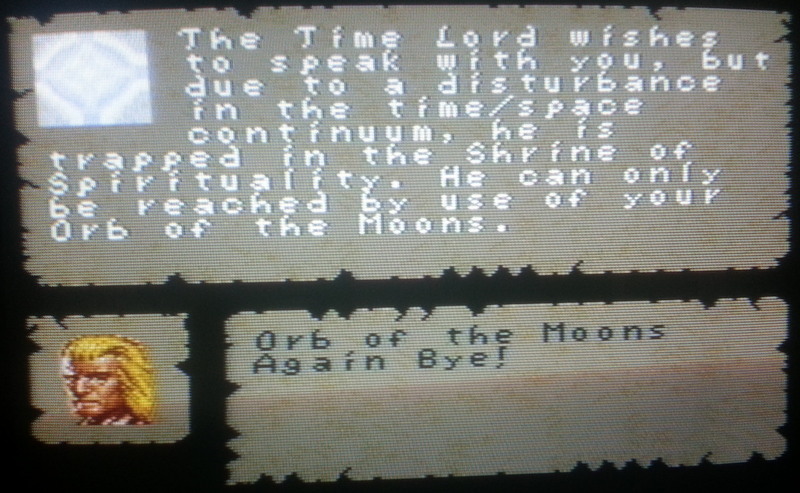 While delivering Batlin’s package in Minoc, I get my fortune told and receive what will ultimately be the main quest of Ultima 7 to find the Time Lord, with the help of the wisps and the emps. 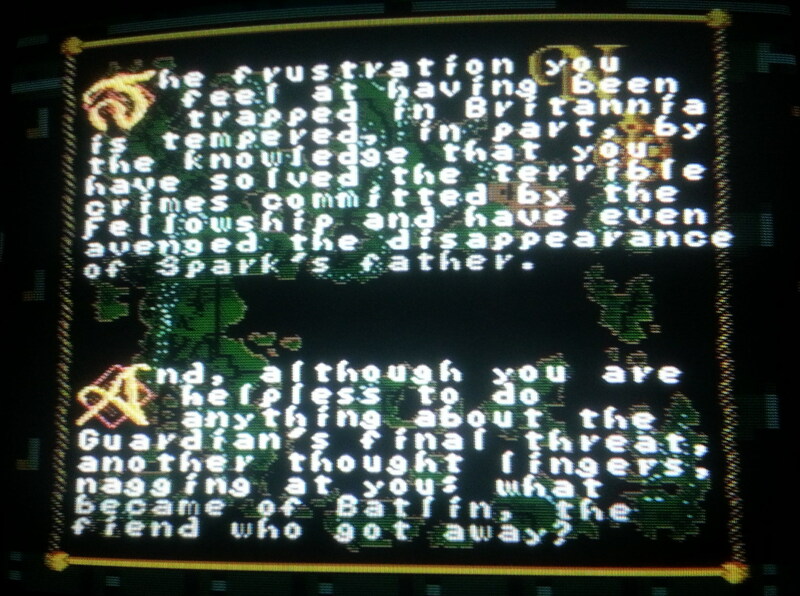 Batlin in the meanwhile sends me off to Destard to retrieve the contents of a chest. 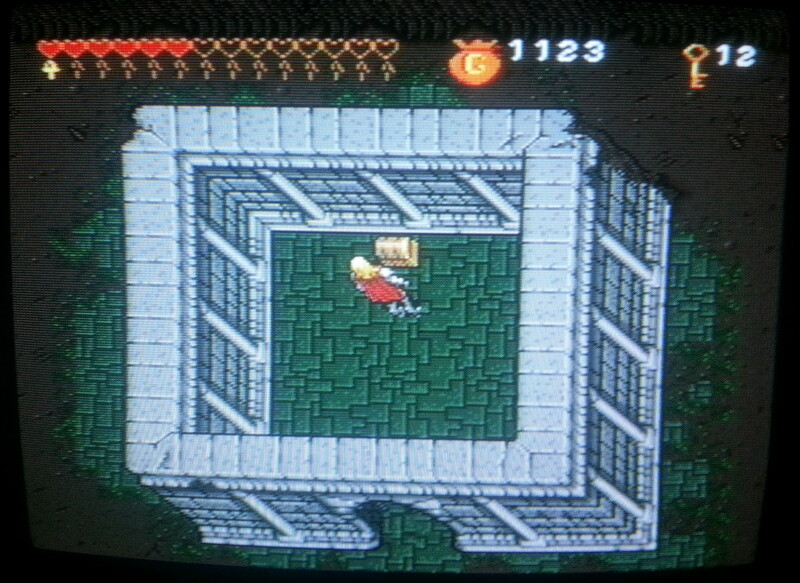 Destard is a maze of identical square rooms and is by far my least favourite of all the dungeons. 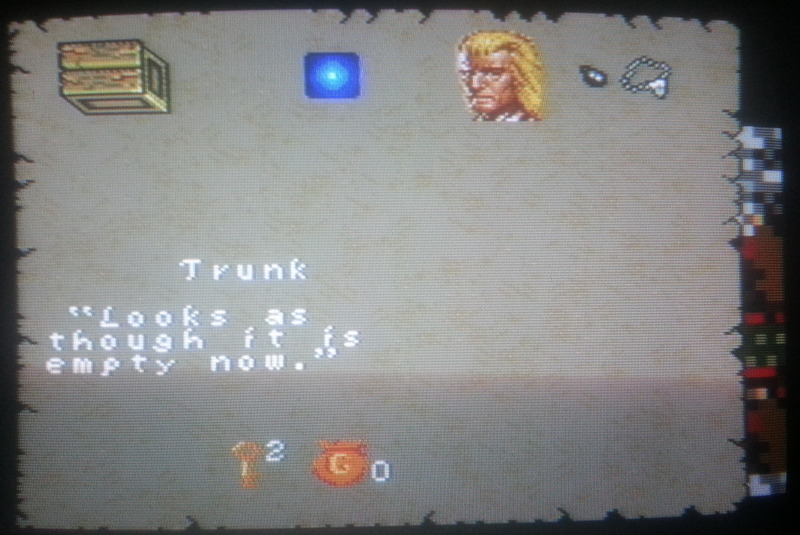 The chest I’m asked to find doesn’t actually contain anything and is surrounded by fireball shooting gargoyles on the walls. I also have to deal with another dragon in here but it’s finding the keys and the exit that take the time. I didn’t have to resort to drawing a map on any dungeons but it may have helped in this case. 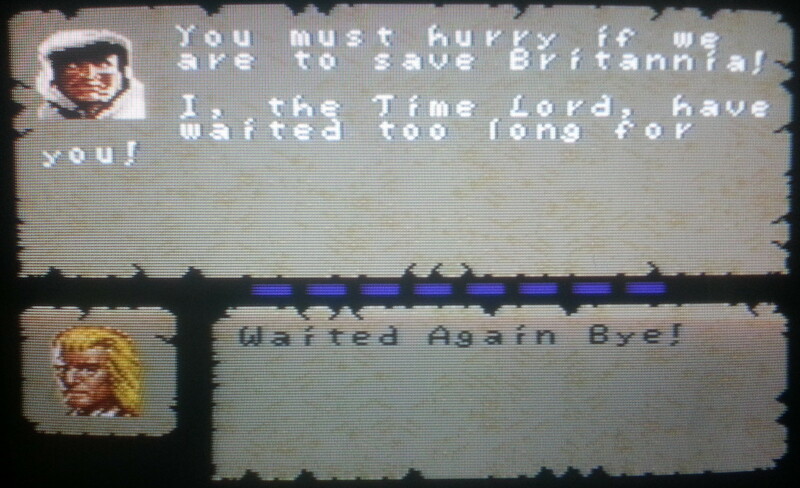 Despite only finding an empty chest Batlin lets me join the Fellowship, so it’s time to follow up on the quest to find the Time Lord. Part 1 is befriending some Emps around Yew. On the way to Yew, I spot a sign for the honey cave which I know I’m going to have to brave so I head there first. 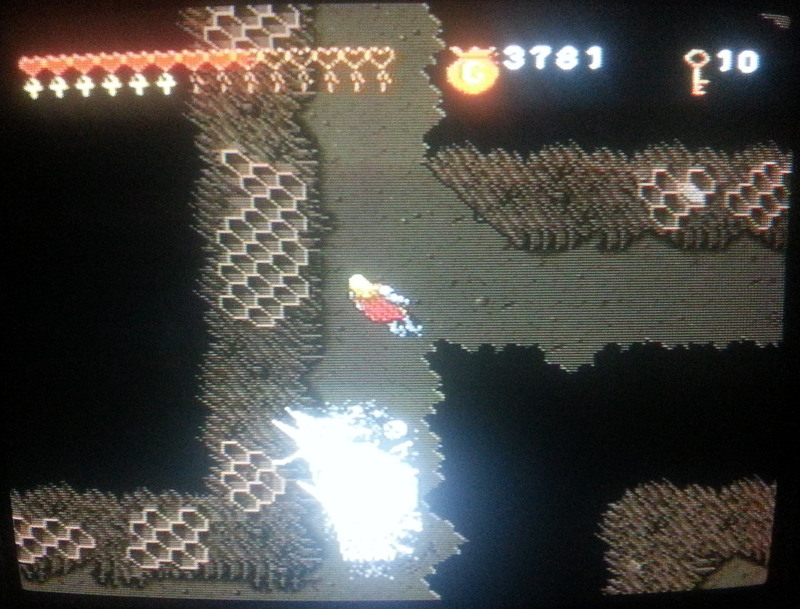 The bees prove to be one of the more difficult opponents as they can fly through all the walls in the dungeon and are very nearly as fast as I am so I can’t simply run away. I learn later that I could have bought a smoke bomb from Empath Abbey (now just a house in Yew) but I manage to get in and out with some honey after a couple of practice runs. 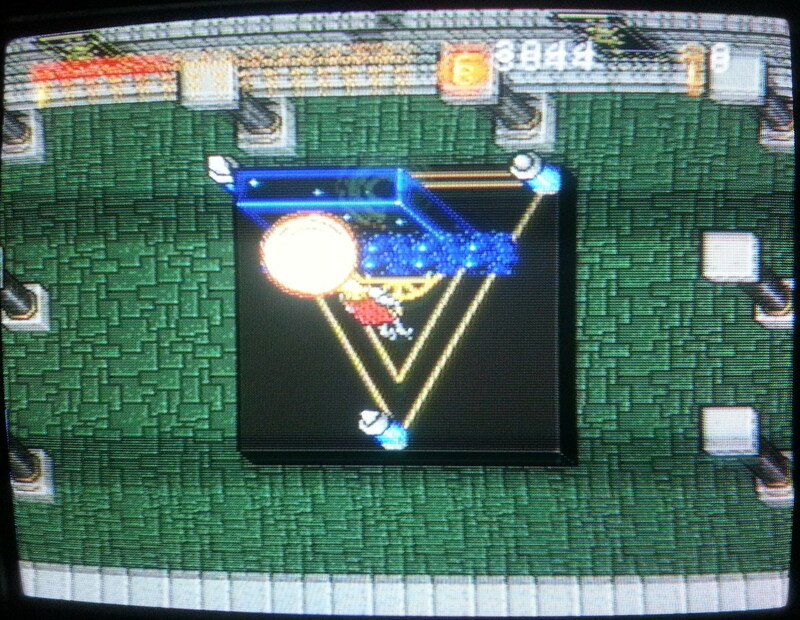 The rock on the second screenshot needed to be moved with a lifting spell to pass which isn’t really a puzzle as such but would bar characters below a given level. After some time sweeping through the forest, I come across a group of 3 emps around a campfire. They talk about the pollution in the area but there doesn’t look to be anything in the game I can do to help. One of them swaps some honey for a magic lantern which will allow me to communicate with the wisps at night. I locate a wisp are just North of the emps. It would be extremely difficult to spot if not for being given away by the change of music. 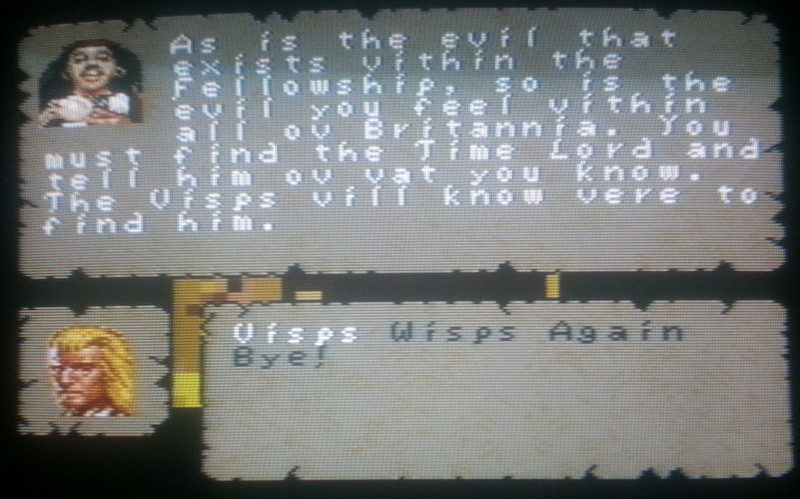 The wisp sends me to New Magincia in order to collect Alagnor’s notebook. This means my first trip off the mainland. Back in part 1, I was offered a magic boat in Britain for 3000 gp which I can now afford so I go and take him up on the offer. I’m expecting this to show up on the dock outside the shop and am a little surprised when it’s not there. 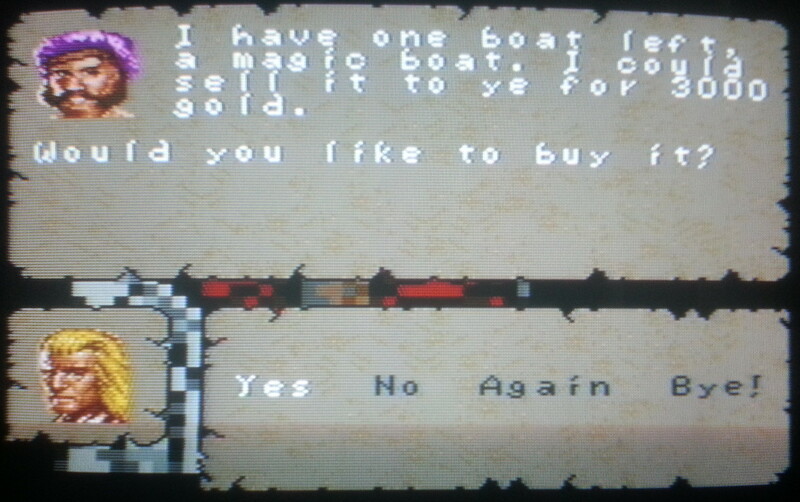 After a short while, I notice it’s actually sat sparkling away in my inventory, a magic boat indeed. If I use this while standing on a dock, I’m given a map which I can select any of the docks on the map. I’m instantaneously teleported to wherever I choose. 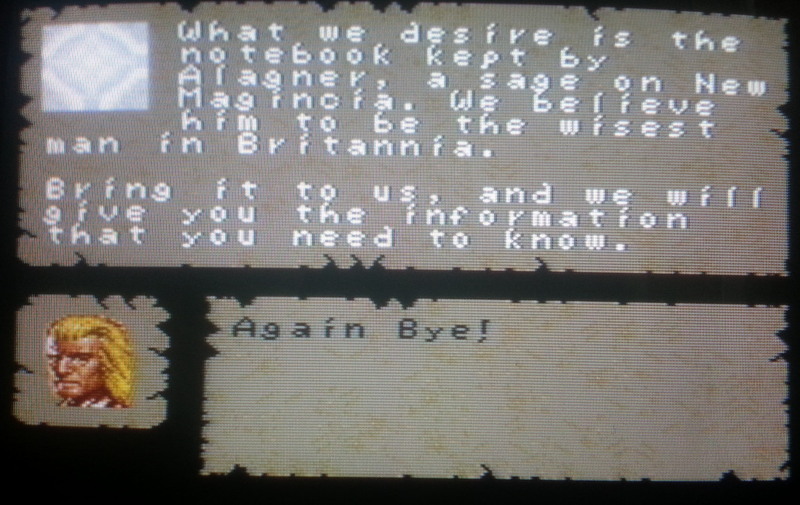 In New Magincia, Alagnor doesn’t just hand over the notebook and instead wants me to go to Skara Brae to learn the secrets of life and death. Curiously he has a door to a dungeon called Sagatious in his basement, one of a number of dungeon names which are new to me. I’m suspicious the notebook will be in here (and will ultimately be proven right) but do things properly instead and head for Skara Brae. 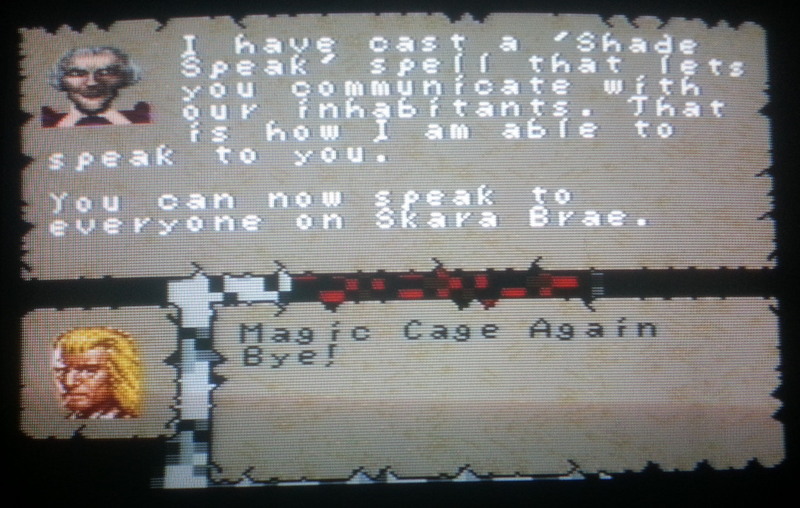 In the real Ultima 7, Skara Brae was destroyed and home only to restless spirits. In this version I can’t quite make up my mind whether the residents are supposed to be alive or dead. 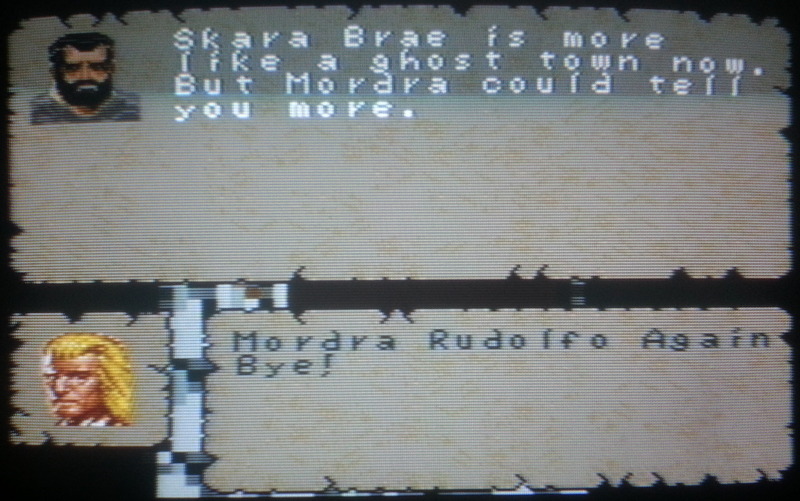 All the houses are in good condition and the residents look normal for the most part but I can’t speak to them until Mordra casts “Shade Speak”. 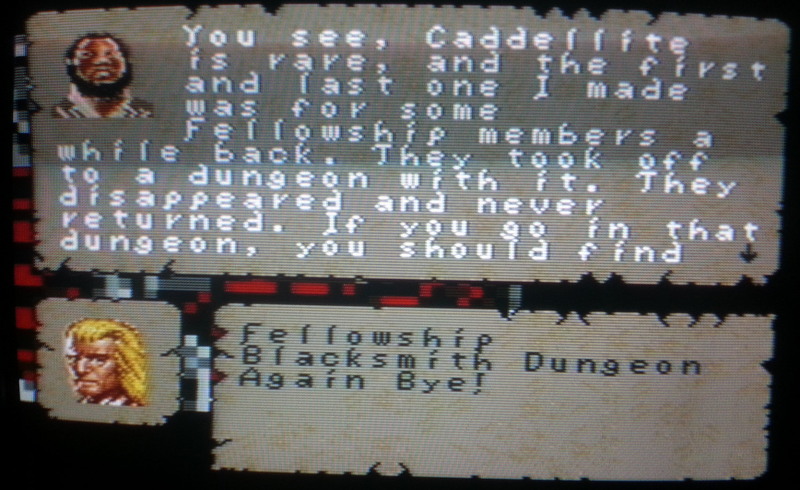 The blacksmith even has a line about the place being like a ghost town these days. Skara Brae is under the control of an evil spirit of some description called Rudolfo who has entranced and stolen the blacksmith’s wife. To complete the quest here I have to carry a music box to her and return a ring to the blacksmith proving that they remember each other. 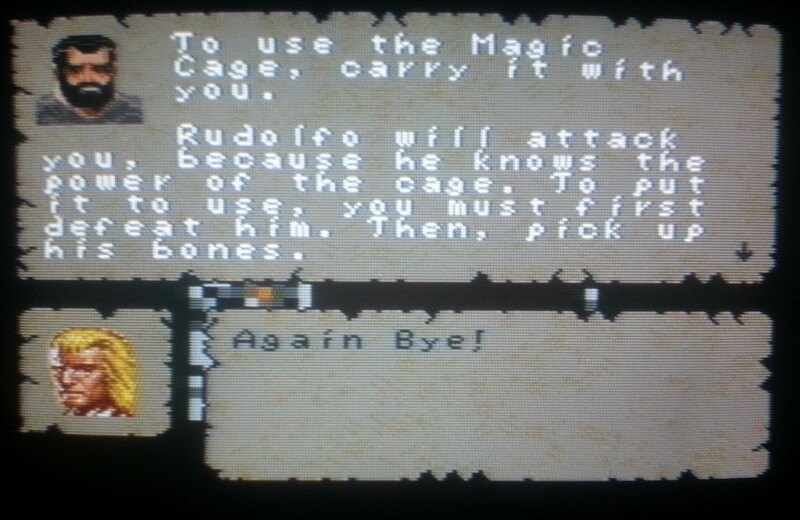 He then hands me over a cage to trap Rudolfo whom I have to kill and then put his bones in the cage. A further dungeon crawl later, I have Alagnor’s notebook which I take to the wisp who fixes my orb of the moons which I can in turn use to create a moongate straight to the Shrine Of Spirituality and the trapped Time Lord. The guardian takes some offense to this. He has been popping up with monotonous regularity as the game has gone on but this does prove useful as a hint that I’m heading in the right direction. The character art for the Time Lord looks more like an old sailor to me. Surely this can’t be the original art – I’d have to go back and check. At any rate, he wants me to go and talk to Penumbra in Moonglow. 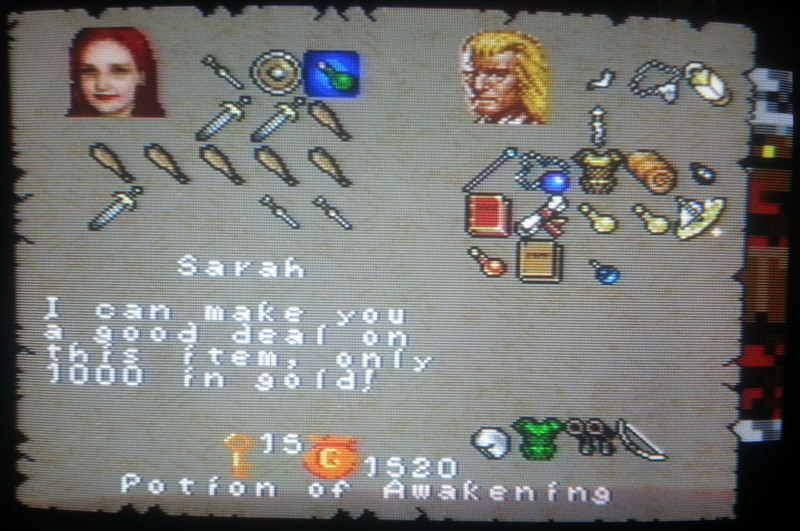 On arriving in Moonglow, I can’t help but notice a potion of awakening for sale in the shop which I take the chance to pick up as I’ll inevitably need it. Sure enough Penumbra is in her usual deep sleep which the potion draws her out of. Despite sleeping through the last 200 years, she instantaneously knows what is going on with the 3 generators being used by the guardian to disrupt magic in Britannia among other things. This is where I come in starting with fetching her a blackrock talisman from the Vesper mine to counteract the tetrahedron generator. 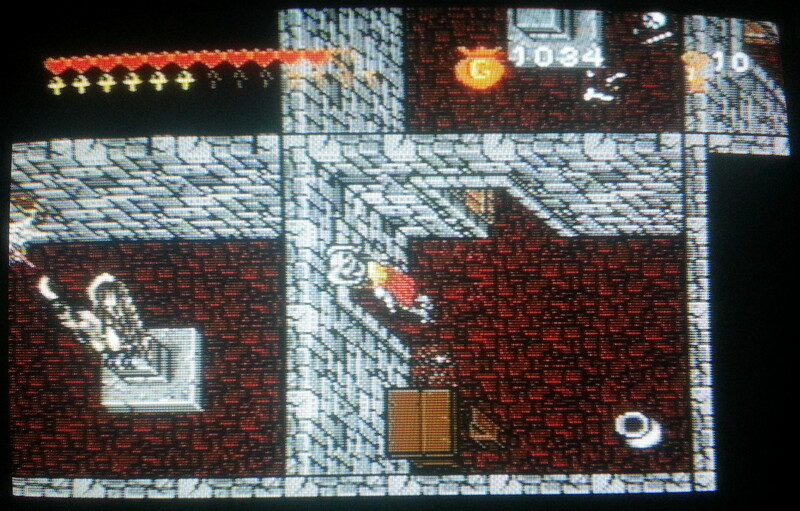 The mine has a handful of walls such as shown above which can only be cleared by using a powder keg (conveniently available in the same dungeon). Another maze negotiated, I retrieve the necklace, hand it over and now have to go and fetch an ethereal ring from Draxinusom in Terfin. 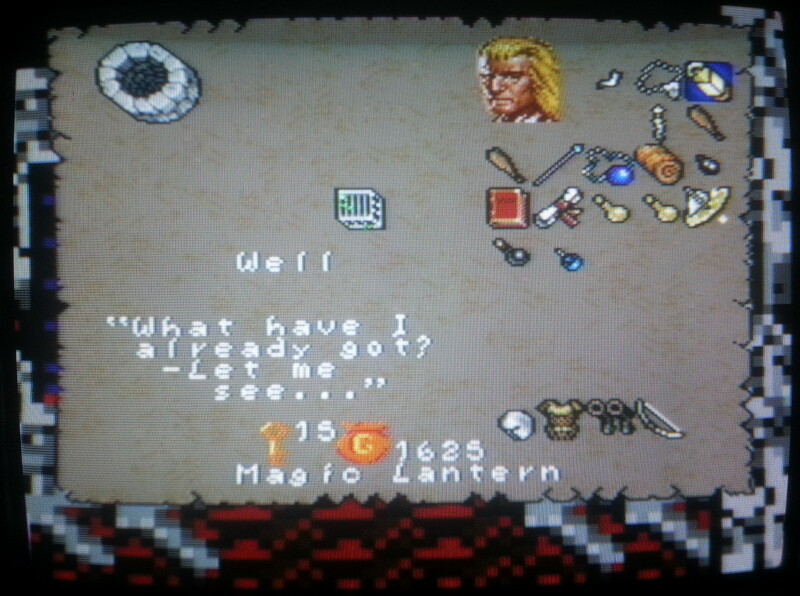 He has of course left it in a dungeon (I’m noticing a running theme here) so it’s off to Spektran to get it. 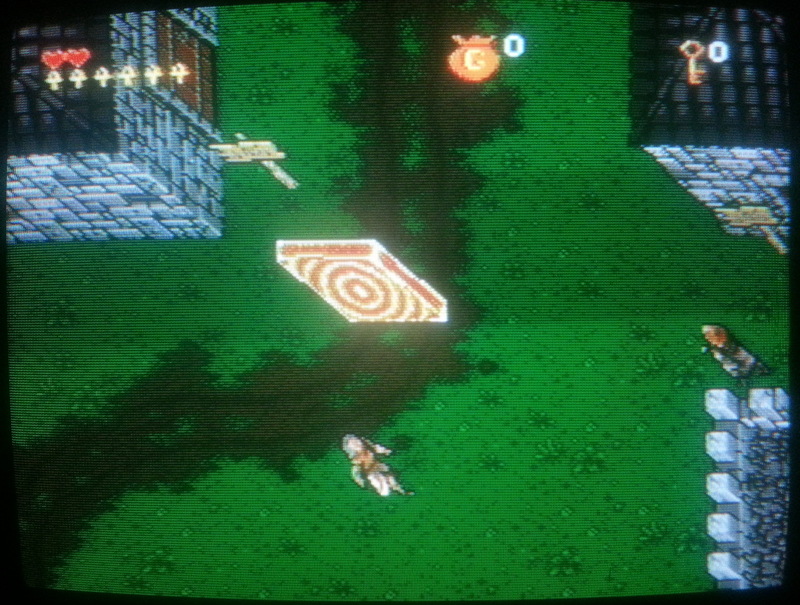 This dungeon has winged statues which come to life when I get near but handily stay still while I shoot them at range. 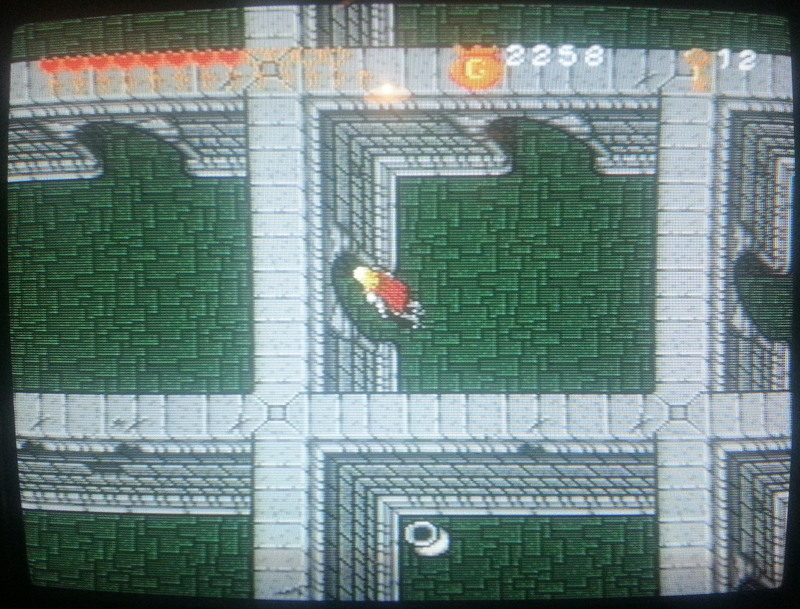 I soon find the ring in a likely looking chest on a lower floor. Getting out again is less easy as I’m faced with this giant red monstrosity which is impervious to arrows. 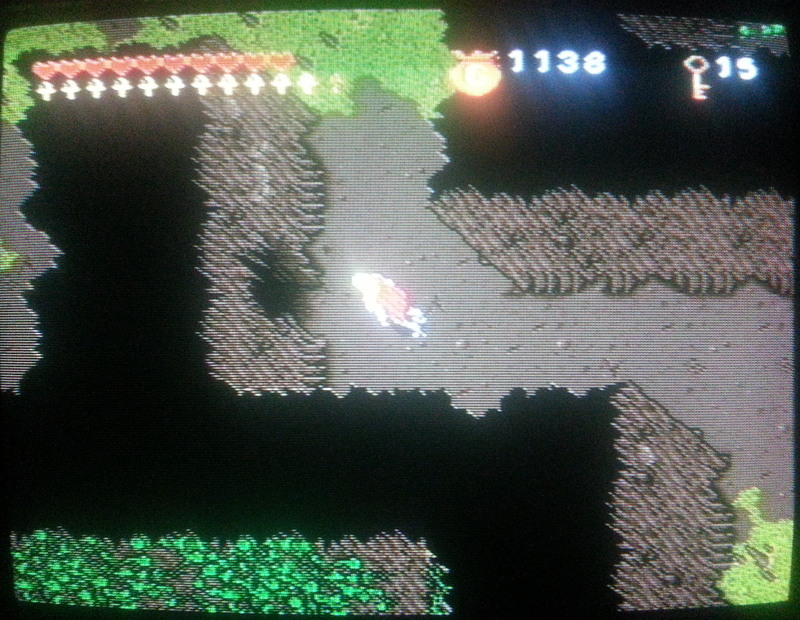 After some trial and error I discover that a serpentine sword I’m carrying does damage it and with an invincibility potion from the same dungeon I manage to take it down. With the ring in hand, I can now deal with the first generator. 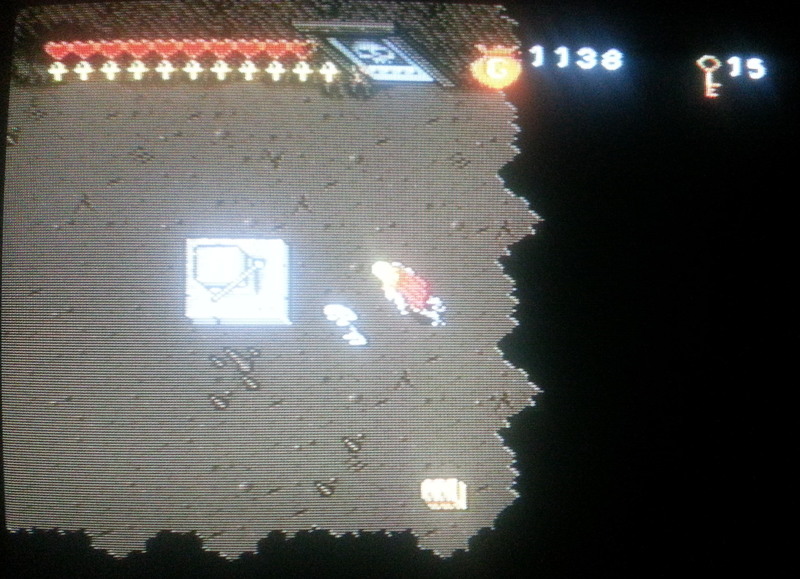 I find the generator after one more dungeon excursion. It’s a whole lot smaller than I was expecting and I just have to pick up the smaller tetrahedron on the pedestal to the right to destroy it. I can’t find my way out of the dungeon at this point and end up resorting to the Kal Lor spell to zap me straight to Lord British. I discover that this drops me down a level and to the minimum experience level for that so I lose 45000 of my 60000 experience in one swoop. This probably should have put me off using it again but I used it once or twice more during this session to speed things along. I don’t think this will cause a problem and if I really need to I’ll grind some experience later. 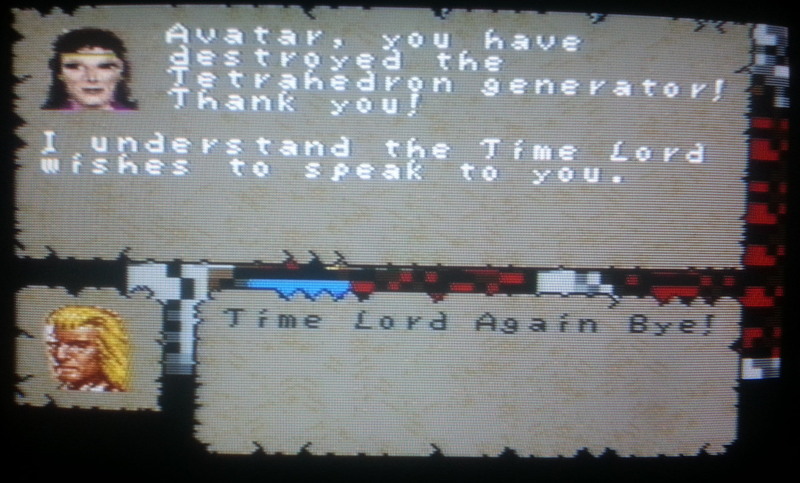 One generator down and it’s back to the Time Lord who sends me off to Despise for #2, after I fetch an hourglass from yet another dungeon. The spherical generator soon does the same way as its tetrahedral brother. 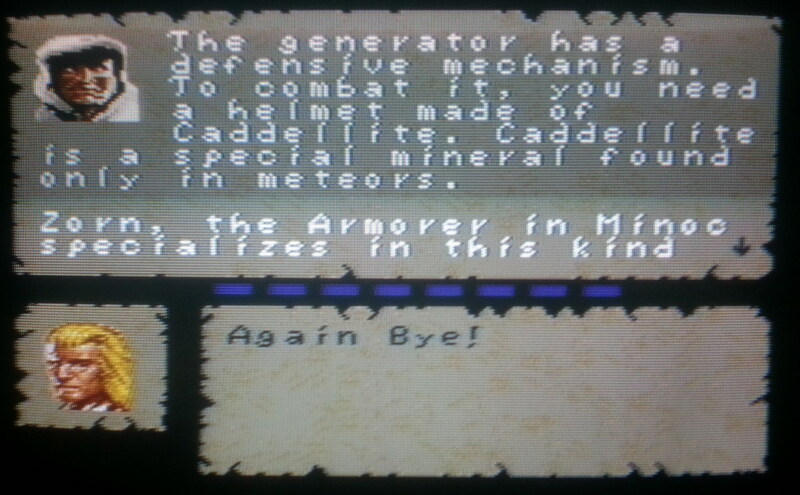 The next goal in part 3 will be to manufacture a caddellite helmet and take down the final cube generator. Progress through this game has been coming a lot faster than I expected and it’s safe to say that I’ll be finishing it next time I sit down to carry on. The majority of my time has been spent in the various dungeons all of which have been passably entertaining if unspectacular. 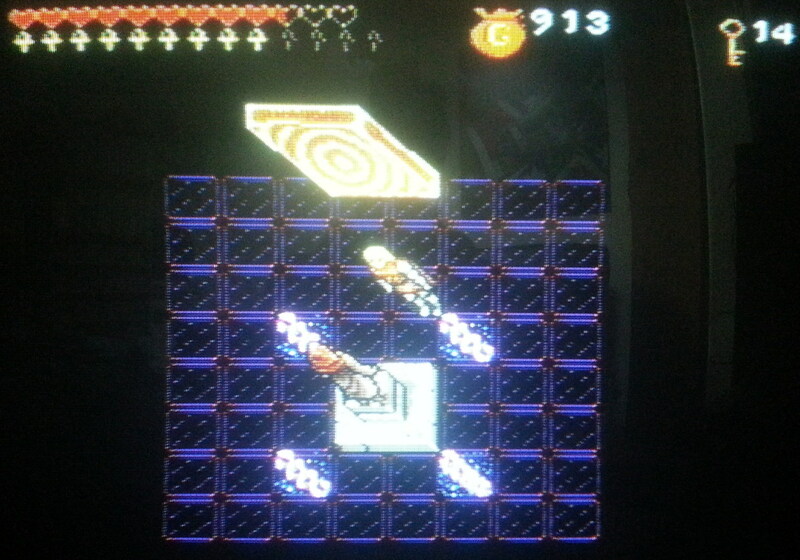 Some have been quite large but the puzzle aspects are kept to a minimum on the whole with a handful of keys or levers occasionally dotted about to slow the player down. This is never a difficult game by any means but there is at least enough challenge to keep it interesting. 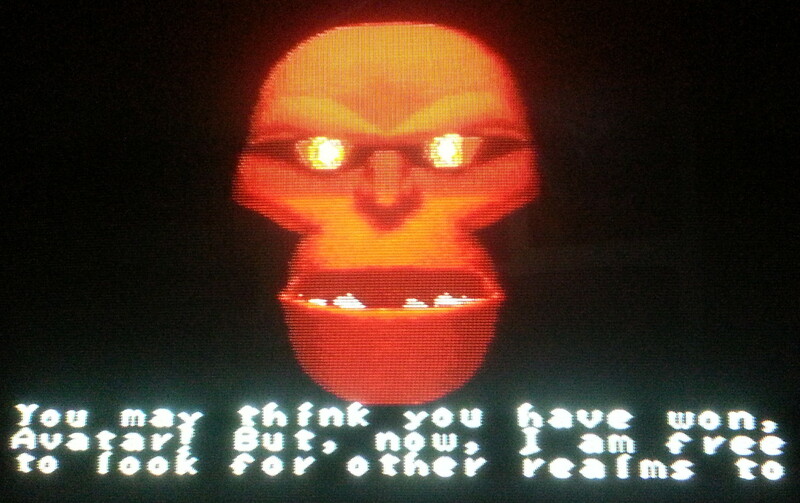 The real strengths in the real Ultima 7 were the virtual world both in terms of the dialog and the interactivity. 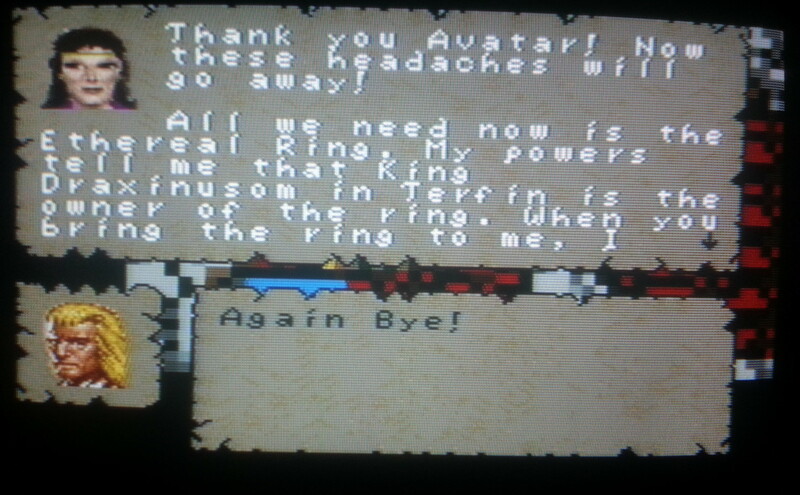 The dialog here is so cut down that it barely even gets the plot across. 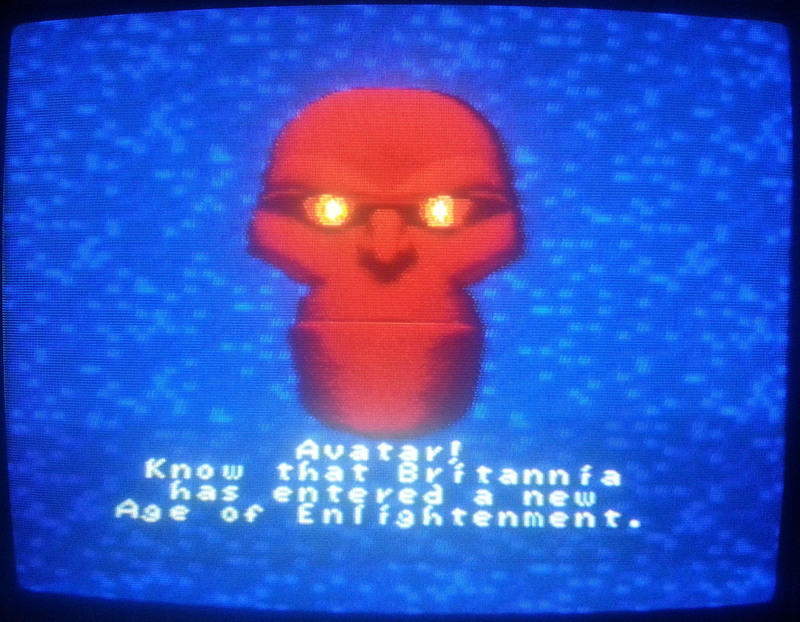 I can’t claim to be overfamiliar with Ultima 7 and this is so far removed from it that my memory is barely being jogged so I’m not the person for a detailed comparison. I can say that with so little text, the NPC’s have no personality and the game degenerates into a series of dungeon fetch quests. It’s a horrible waste of the source material. 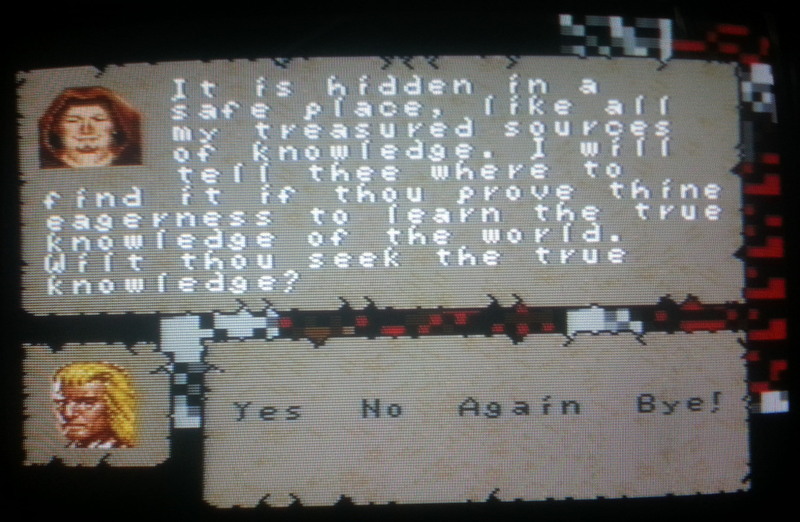 Plenty of other RPG’s on the SNES were so much deeper than this. As for the world interactivity, it’s reduced down to a handful of useless items that can be picked up, carried around and then dropped again when you need the space for something relevant. The open world is still there I suppose so it does get credit for that and I have stumbled across the occasional treasure chest in the wilderness but for the most part the world is compressed down so much that there is nothing of interest to discover. 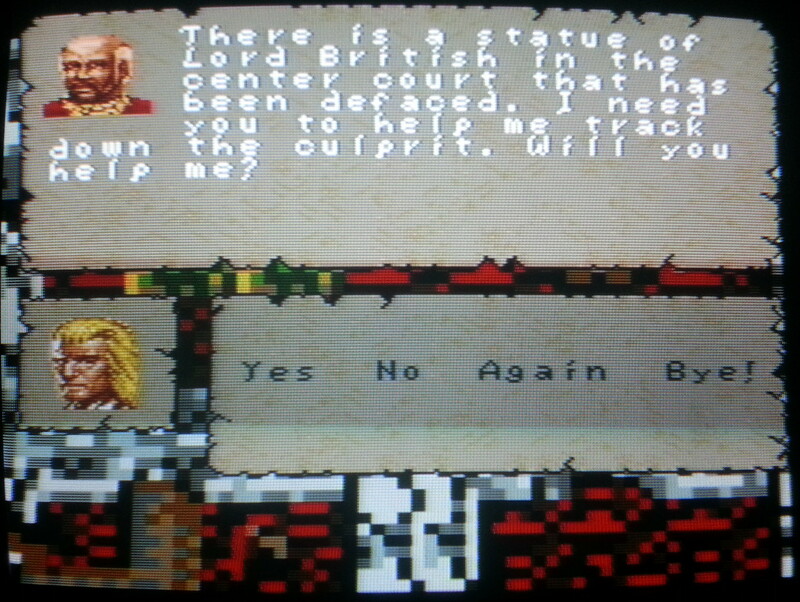 I’m not seeing any particular incentive to explore when I can crack on with the quest instead. As a final word I have to quickly mention George Oldziey’s Wing Commander Music Kickstarter. This is an attempt to raise enough money to record sections of the Wing Commander 3 + 4 soundtracks with a full orchestra. How many sections depends on how much money with 15 minutes if the project is exactly funded and considerably more with stretch goals (full details in the updates section). I’ve always loved the soundtracks in both those games and backed this myself without needing to think about it. As it stands, I have a feeling it will be a hard sell for all but the more enthusiastic WC fans but it’s not a huge amount of cash so it must have a chance of getting funded. It would get a whole lot more appealing if stretch goals come into the picture. I’d love to see this happen – if you liked the music in those games anything like as much as I did please consider contributing. 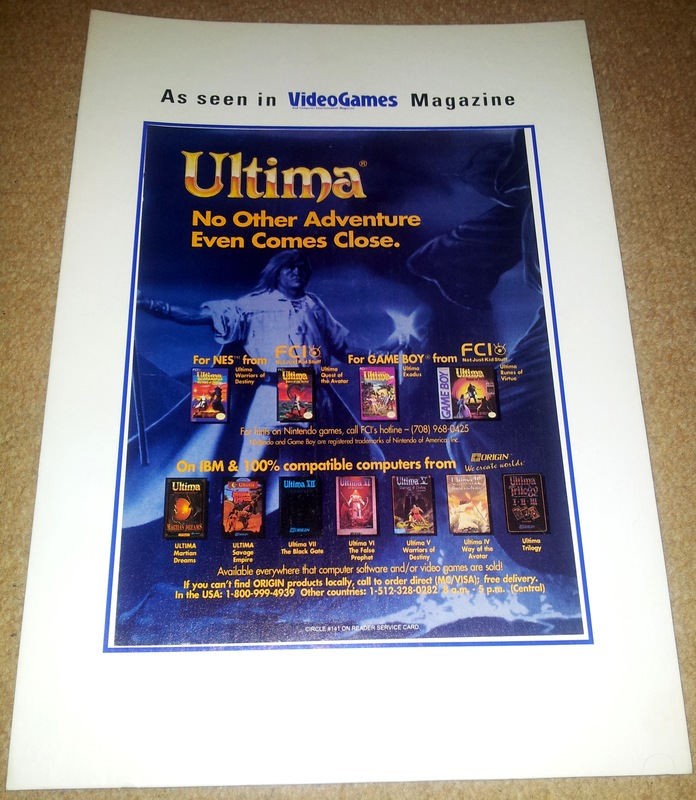 The SNES port of Ultima 7 was published in 1994 via Pony Canyon with the development work being done in house by Origin. Going on past experience, this isn’t a promising start when other games Origin developed themselves for Nintendo systems include Metal Morph and the truly dire NES Ultima 5. 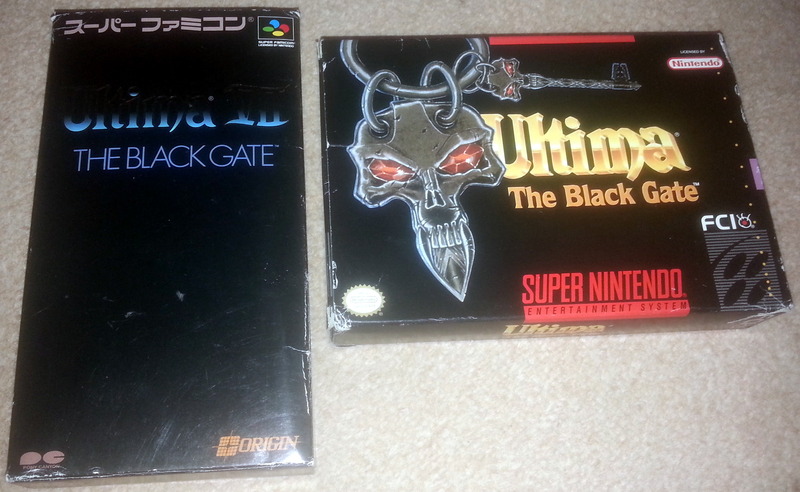 By contrast the games originally developed in Japan such as NES Ultima 3 + 4 and SNES Ultima 6 worked out far better. 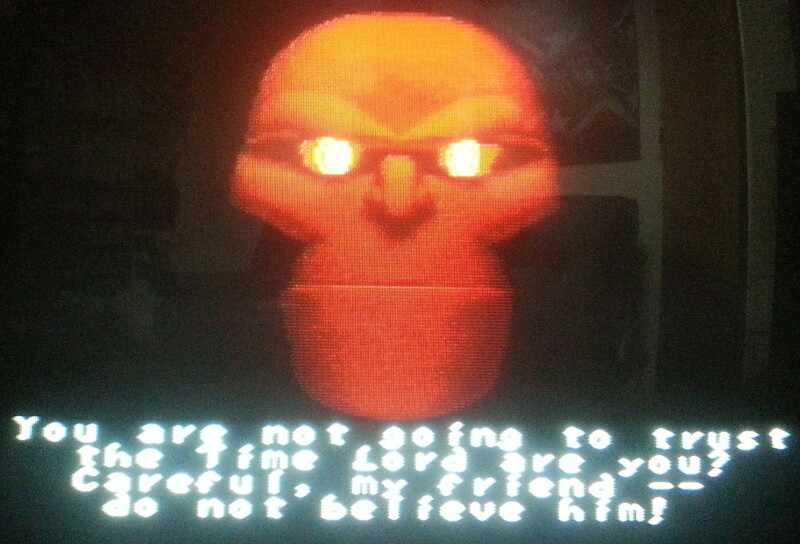 Porting the mammoth Ultima 7 to the SNES would look to be a daunting prospect for anyone so my hopes were definitely not set high playing this for the first time. However good or bad the game, boxed copies of the USA release are quite hard to come by with some crazy money currently being asked for sealed copies on Ebay. Unusually, the Japanese version on the left is by far the cheaper option being extremely common. 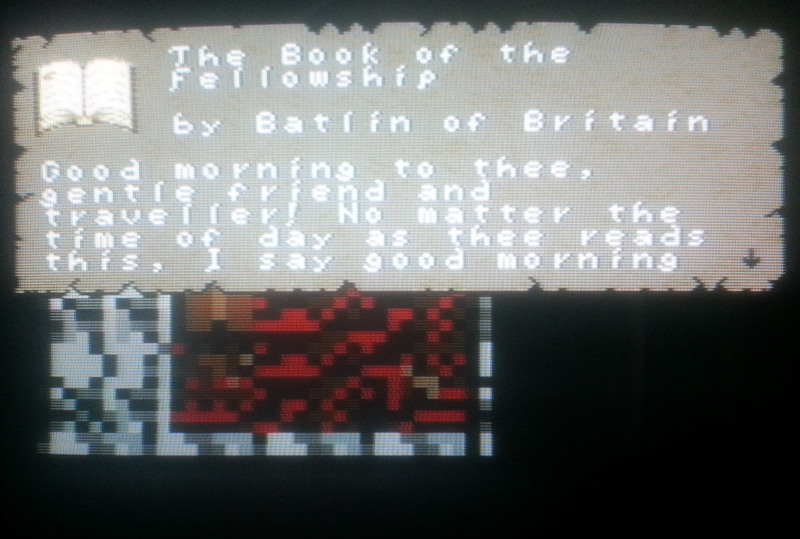 The manual for the USA release has basic but less than thorough instructions for playing the game + all of Batlin’s backstory as in the PC documentation. The game starts with the familiar figure of the guardian quoting his usual spiel, sadly without the menacing tones of Bill Johnson here. As for the rest of the intro apart from the flapping butterfly (which explodes when it lands on the logo? ), it’s not present and it’s straight to Trinsic. 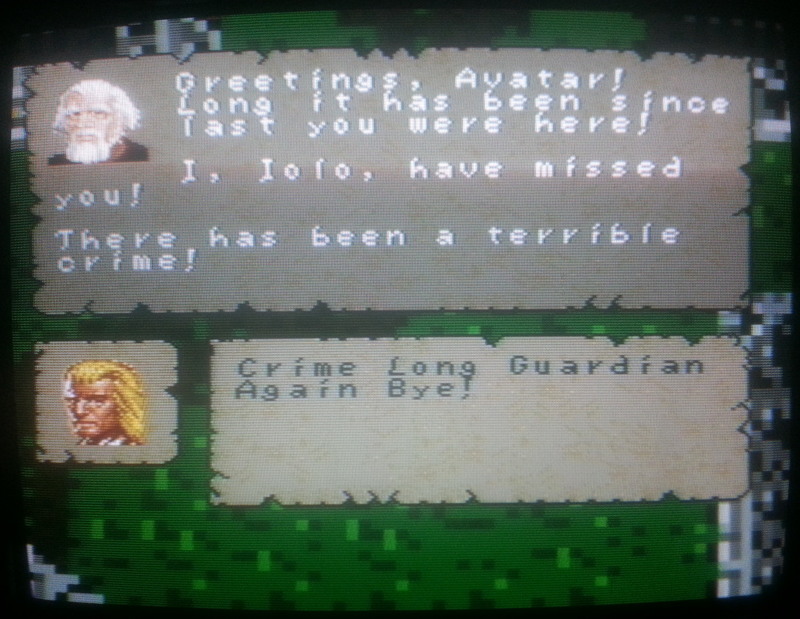 I’m greeted by Iolo with some rather stilted dialog but at least the character portraits are shown here which helps to add some personality. The keyword system is used for conversations but in a serious breach of Ultima tradition I can’t ask about name and job and people just go and introduce themselves without being asked. The dialog has been seriously cut down and is often less than subtle. It’s not exactly unapparent that the Fellowship may be up to no good within the first 5 minutes. 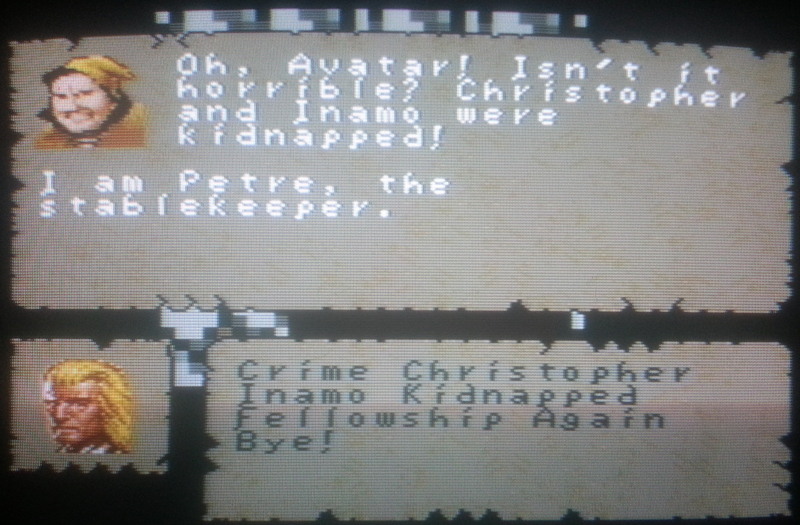 True to form for a Nintendo game, the serious crime turns out to be somewhat less serious than Ultima 7 veterans may expect being a kidnapping rather than a murder. Presumably that means I’ll get to rescue Christopher and Inamo this time around. I’ll have to do all of this on my own as there is no party support and Iolo deserts me immediately after welcoming me back. I’m soon asked to look into the crime by the mayor and I take the chance to have a look around the town. Graphically, the port doesn’t look too bad. The scrolling is nice and smooth which is more than could ever be said on the PC. 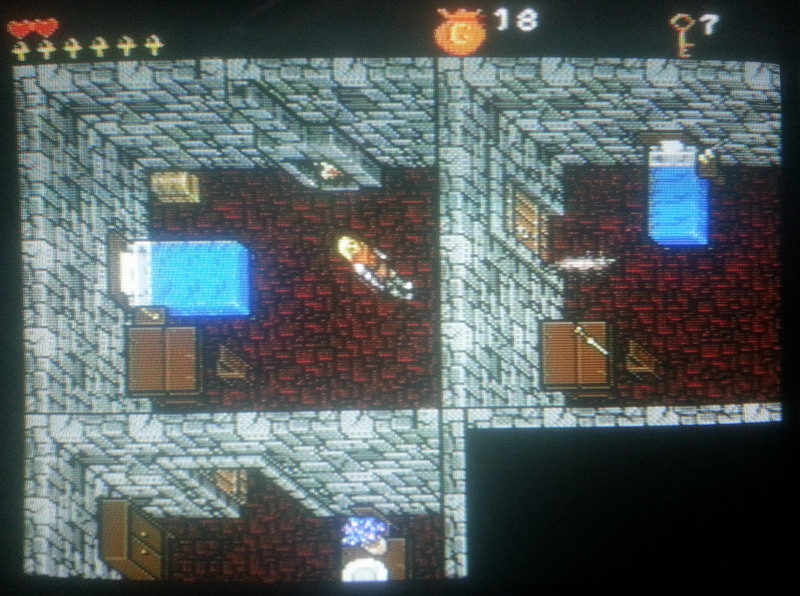 There are no weather effects however, and all the interiors are done on a separate map. 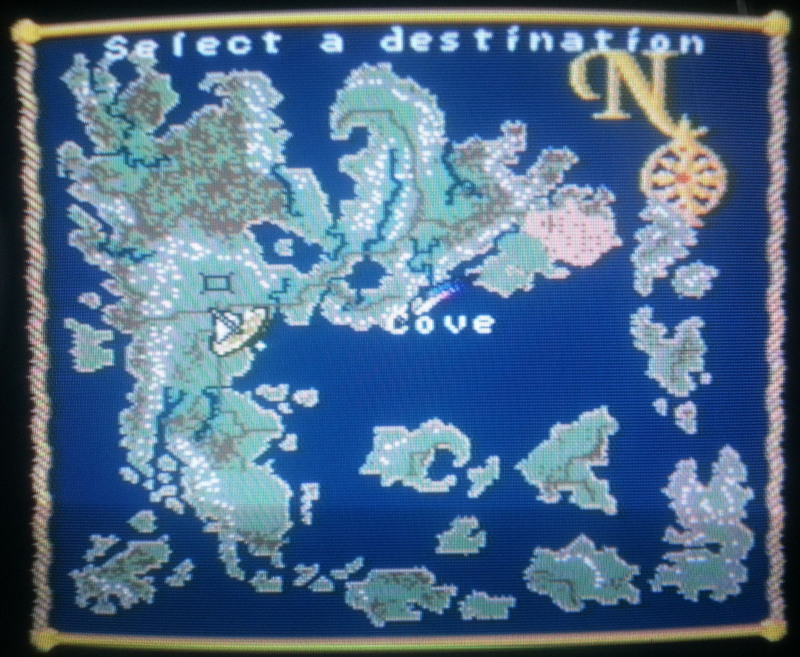 The layout of the town bears little relation to the original with many locations and NPC’s missing entirely. Of the houses that are left, most do have basements all of which turn out to be infested with rats, gremlins, skeletons spiders and slimes. These pop up out of nowhere when stepping in certain locations and tend to reappear every time you leave and come back, as does just about every single other item in the game as far as I can see. I’m free to plunder and steal at will and get the impression that the cellars are in effect no more than mini dungeons. I have to give some credit to the interface for being quick and simple to use. I can assign weapons to either hand which can be used with the x + y buttons. Shoulder buttons move between inventory and equipped items and it’s all second nature if massively slimmed down. The number of keys I’m carrying is shown under the Avatar’s level. 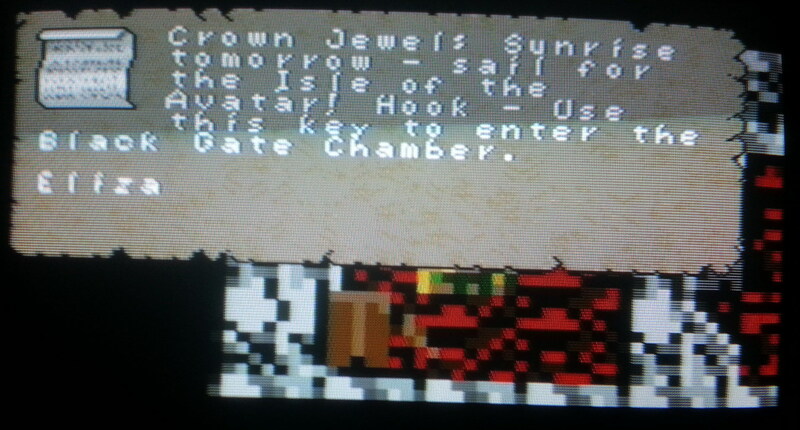 Most Britannia residents appear to have hoards of these skeleton keys in their basements which can be used on most locks rather like skull keys in Ultima 5. 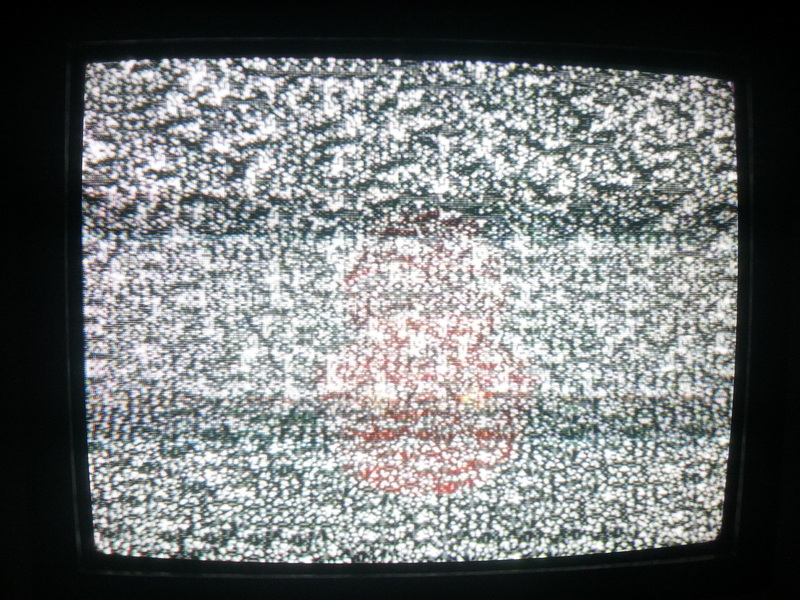 The stock of these is shown on screen at all times up to a maximum of 15. I’m yet to come across any other sort of key but there have been some doors I’ve been unable to open. My stash of gold coins is shown at the bottom right. Given that I’m free and apparently encouraged to plunder whatever I like + the fact that every single item respawns when you leave and come back, I can’t see me ever being too short on money. At the bottom left of the screen, the hearts represent my health and the ankhs my mana. 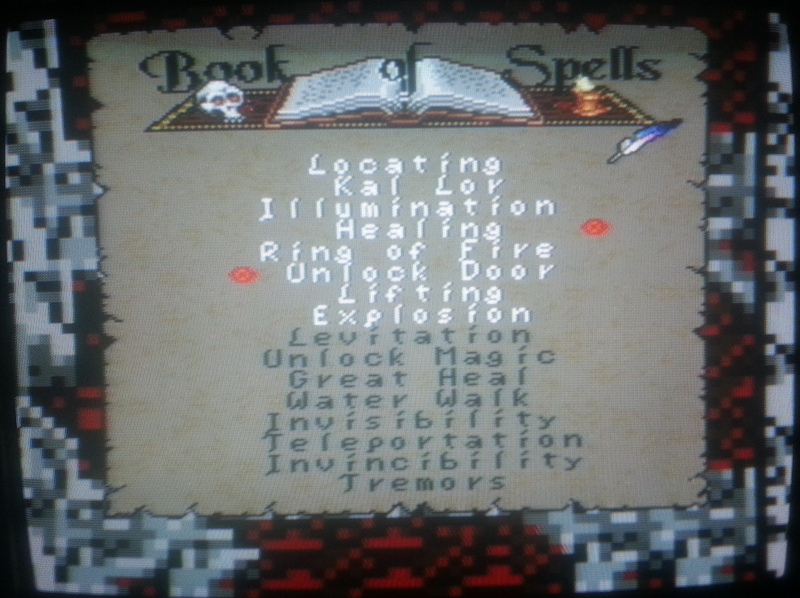 I can’t cast spells yet as I don’t have the spellbook but this has been simplified down to assigning a spell to each shoulder button from the spellbook and doesn’t require any reagents, only consuming mana. That just leaves combat which is a simple affair of bashing the button relating to one of the two hands as fast as possible to use that particular weapon. I start out the game unarmed but am soon equipped with a sword and later a bow. 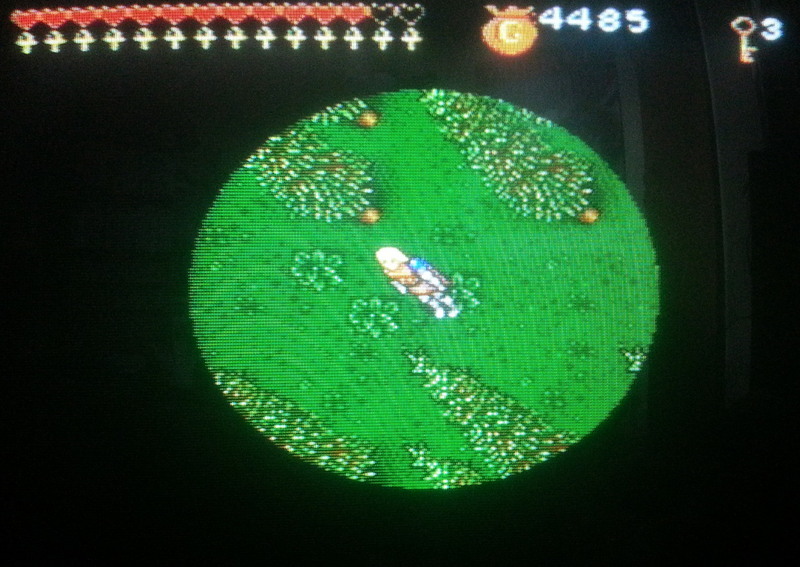 The sword pushes the enemy back a little on each hit so combat requires retreating slightly then bashing the button as fast as possible while the enemy advances onto it. The bow doesn’t appear to push back but does have a longer range so this is at least slightly tactical and requires more manoeuvring. Health and mana both recharge slowly over time or can be regained through eating food/ankh’s which can be found scattered throughout the towns or dropped by some of the monsters. 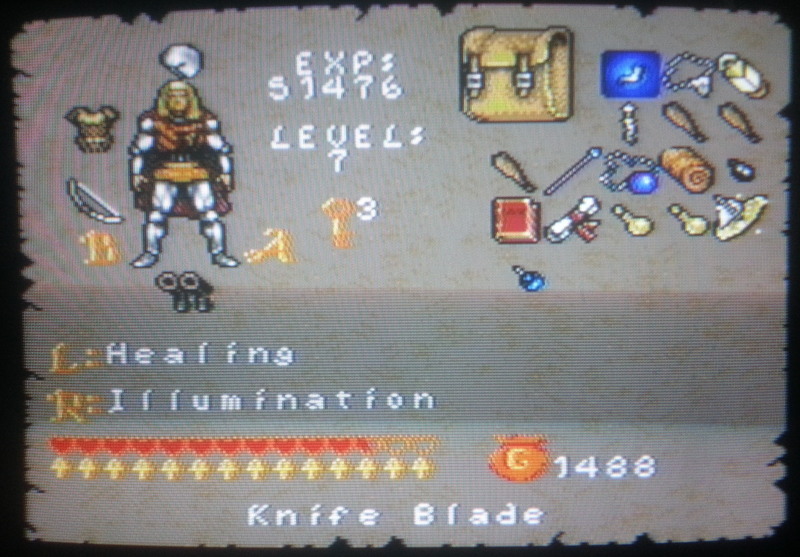 As my Avatar levels up, the maximum health and mana increases. 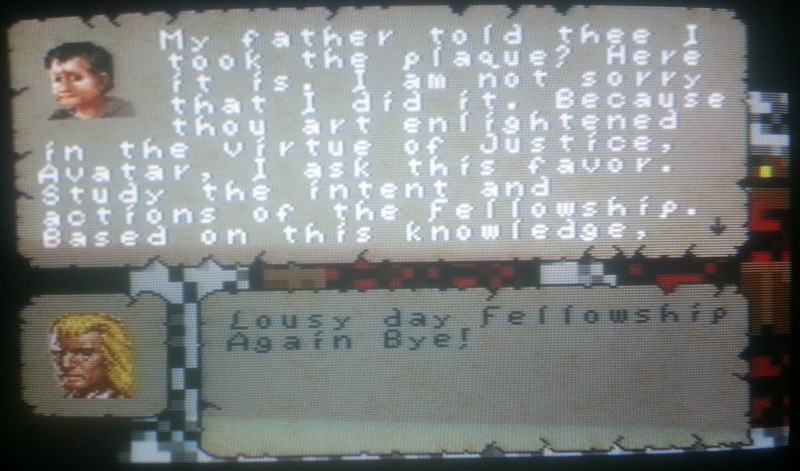 Ultima 7 is famous for the vast amount of readable books littering the world. There are a handful present here but they have been seriously chopped down. 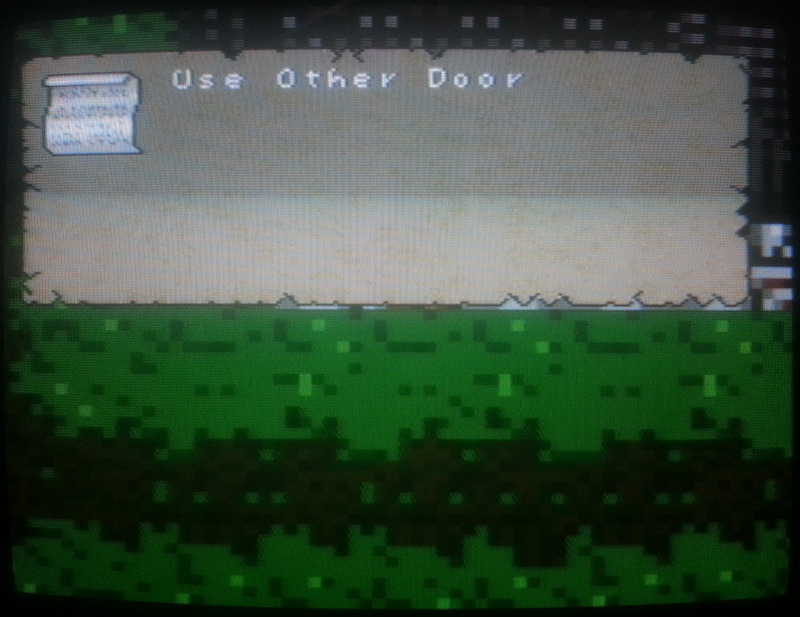 There is also reading material in the form of notes on many of the doors saying “Use other door” and indeed I can’t enter the buildings through any of these but can exit through them. It’s like there is some sort of technical limitation to the interior maps of only having one entrance but a couple of exceptions have proved this isn’t the case so I’ve no idea what this is about. Finding Spark is tricky as he doesn’t appear to have a house anywhere that I could see but I do eventually locate him wandering around outside. Some of the NPC’s definitely have schedules but I’m suspicious that they are simply teleporting between locations until I see evidence otherwise. Investigating the kidnapping/murder is just a case of talking to everyone in town in the right order after which the mayor gives me the password and I’m free to start the long trek to Paws (which turns out to be about 2 screens away). Paws looks much the same as Trinsic did with no hint of it being less well off than any other town. There is another quest to do involving tracking down the thief of a plaque from the Fellowship. Once again this is just talking to people in the correct order. 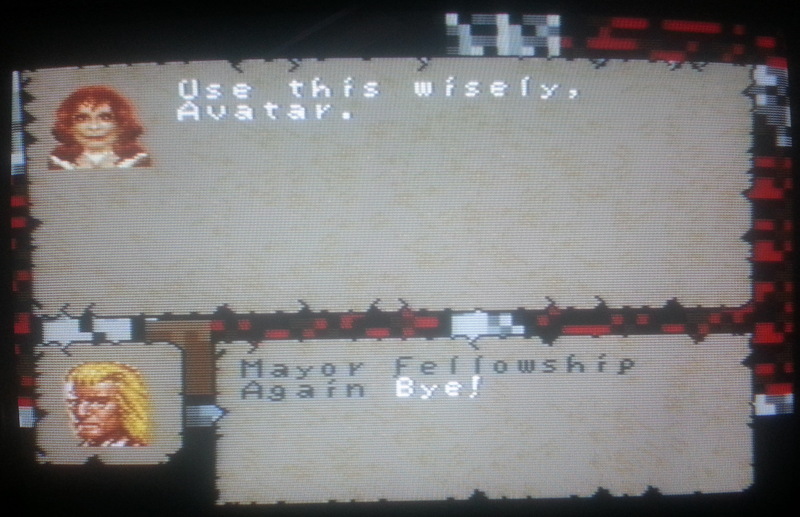 With maybe 7 or 8 NPC’s in town this isn’t a big task. I’m rewarded with a magic bracelet for my troubles which will heal me at the expense of some mana. 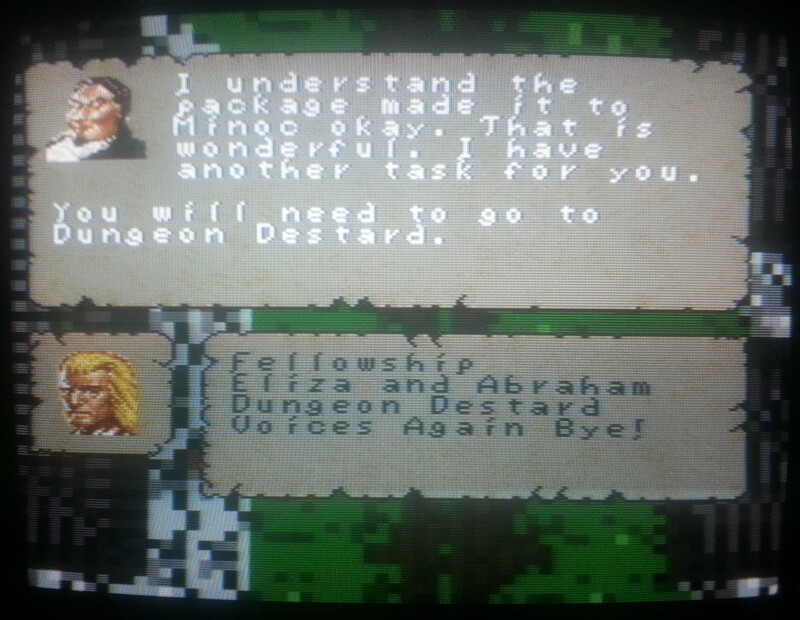 I wander off path at this point and almost immediately stumble across Destard. It’s guarded by Mongbats who have a nasty ranged attack and I get the impression I need better armor from the amount of damage it does. I’m not planning on exploring but I do poke my nose into the dungeon only to find that my field of view is reduced to a tiny circle around the Avatar so I immediately give in on that idea. 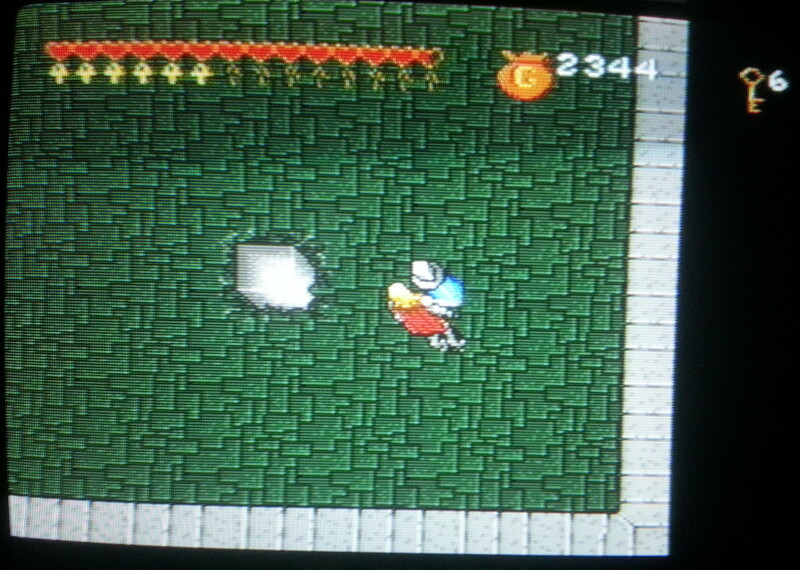 If there was any way for me to get back out of the dungeon I couldn’t see it so I end up reloading. While wandering around, I can’t help but notice that the overland map uses the same monster spawning mechanic of specific monsters appearing when stepping onto certain locations. I can literally retreat a few steps back during combat and head forward again only to have the same creatures respawn once more. Just like the Trinsic to Paws journey, Britain is almost touching Paws and I’m getting the impression there won’t be much wilderness to explore. 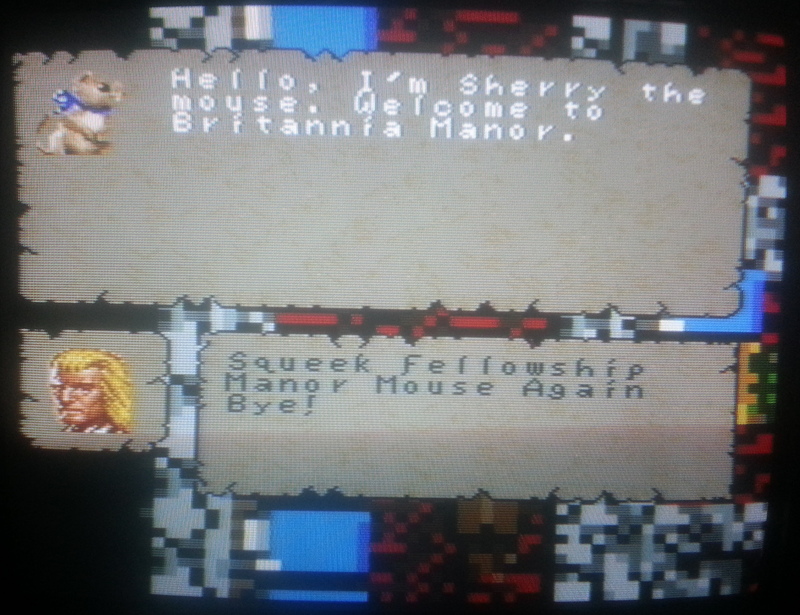 Castle Britannia is now Britannia Manor presumably since there wasn’t room for any castle graphics. The place isn’t a hive of activity but has twice as many NPC’s as any other location I’ve been to. LB hands over my missing spellbook giving me the chance to cast a few spells at last. I’ve already levelled up to 4 or 5 at this point which I think governs the spells I’m allowed to use. 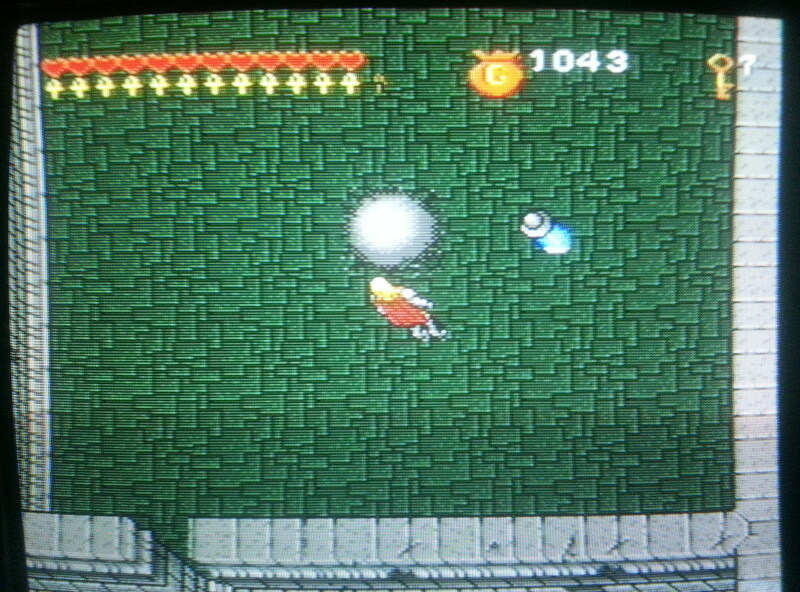 The speed I’ve been levelling at is ludicrous for what is supposedly an RPG. I can only assume that I’ll be maxing out the next time I play. I notice an illumination spell in here which will help in the dungeons no doubt but I’ll hold off going in them until I absolutely need to. I’ve not fully explored Britain yet but have received several tasks including delivering Batlin’s package to Minoc + taking the new law about the pollution of Lock Lake to Cove. Shamino is supposed to be around Britain somewhere so the plan is to find him and then head off to Cove which is presumably going to be 1 screen East of Britain. I’ve played about 2 hours to get this far. I’m not long into this but it is without a doubt the most simplified and dumbed down console port I have seen. When compared to the original game, it’s pretty insulting in all honesty and appears to have been aimed at primary school kids. 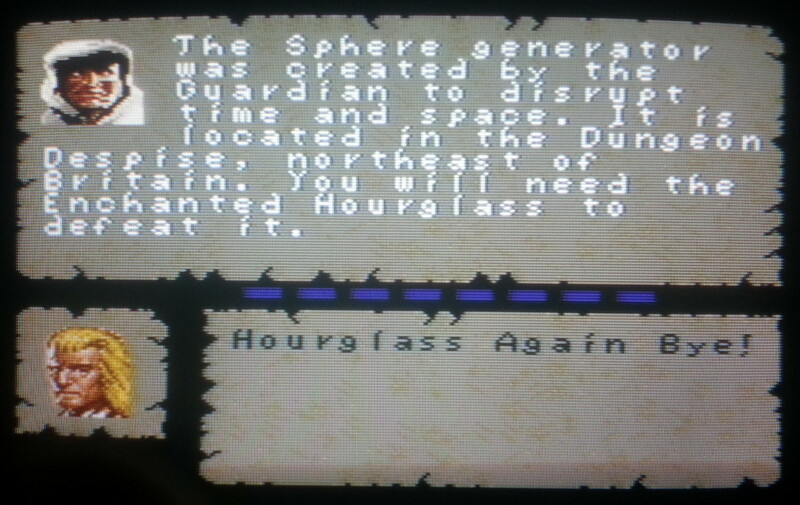 The idea of this being someone’s introduction to Ultima 7 doesn’t bear thinking about. 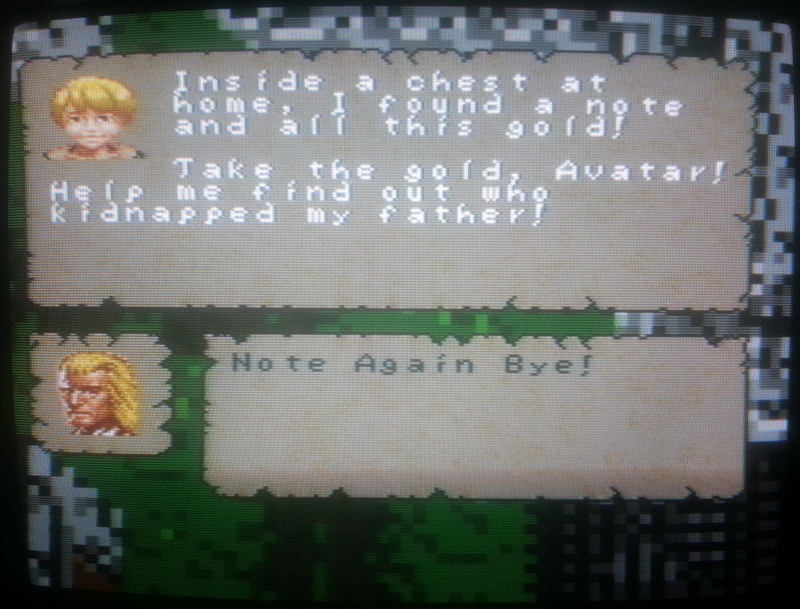 It’s almost like NES Ultima V all over again. What it does have going for it over NES Ultima V is a nice quick control system and half decent graphics thanks to the SNES hardware. It’s also got a smattering of the original soundtrack which although cut down like everything else is at least more varied than the aforementioned U5. Maybe it’s just because I expected the worst but I’m actually quite enjoying this as a simple hack and slash affair. I’m not going to say it’s good but putting the original classic U7 to the side, it is reasonably playable. 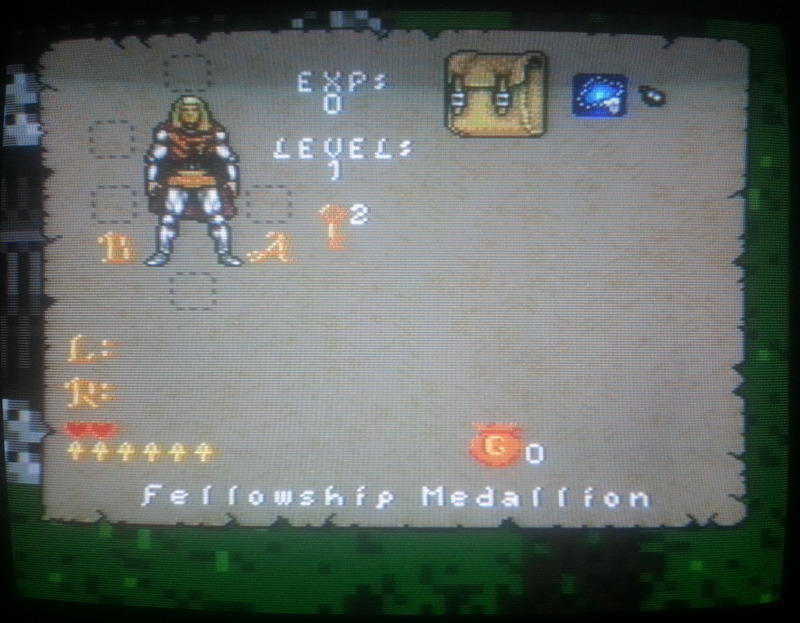 Think Runes Of Virtue without any puzzles and you won’t be too far off. It’s also different enough from the original to pique my interest for where it’s going. 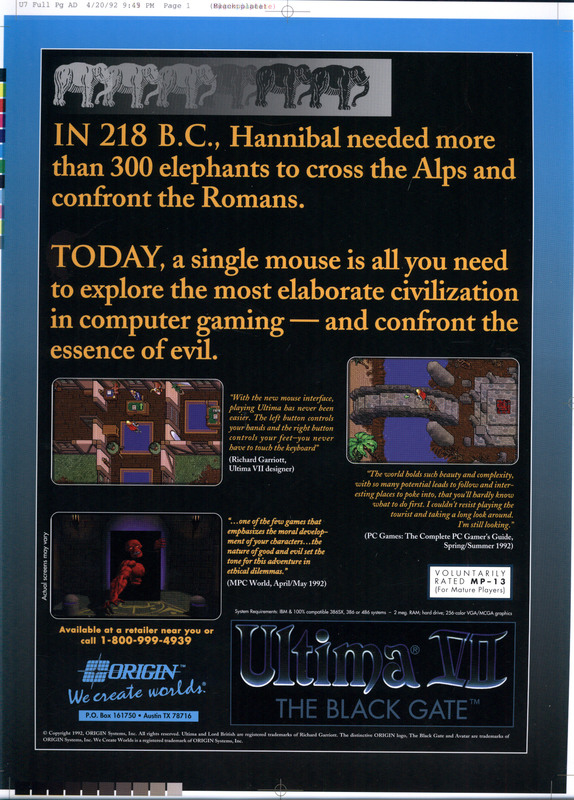 This is dated 20th April 1992 which would have been 4 days after the game was released and sells Ultima 7 on the basis of it being easier to play than confront the Romans with elephants which is hard to argue with. Ultima 7’s all mouse interface was way ahead of anything else I can think of at the time and still holds up well today, inventory shuffling aside. It’s quirky but I reckon this advert did a decent job of conveying several aspects of Origin’s latest epic in a small number of words. It was ultimately used on the back cover of Computer Gaming World and presumably other magazines at the time with an alternative all black advert following on some time later. 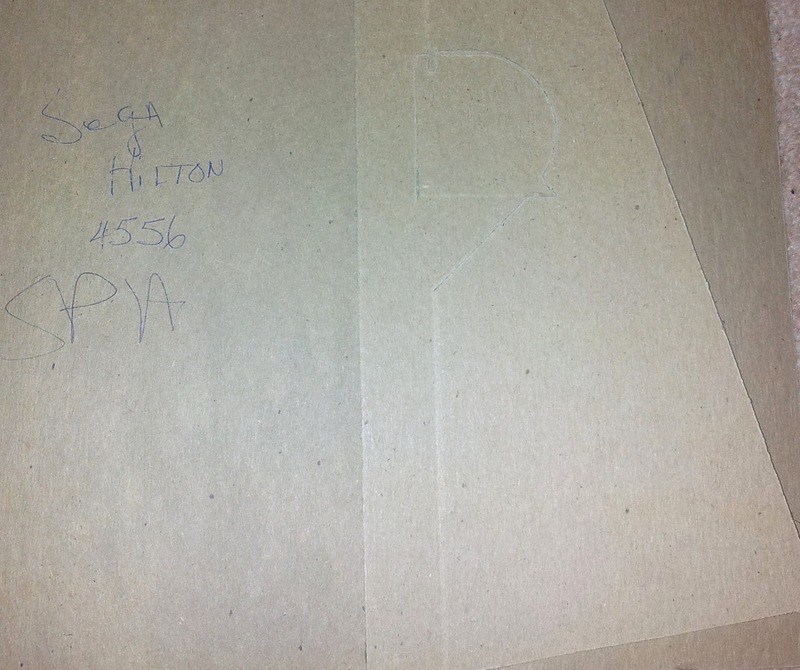 The proof is marked bad on the front of the envelope which usually means some of the colour separation isn’t correct going on those I’ve seen before. The negatives for all these adverts come in four plates (3 colour + 1 black) which clearly gave scope for things to go wrong if something was left off of one layer. In this case the animal behind the T of Today is far darker than in the final version which can be found on the Ultima Codex.